This has been the longest that I have gone without a post. And it makes me uncomfortable. More so because I wasn’t sick or busy. Perfectly hale, hearty and enjoying all the interesting posts and doing things that I usually do. And yet, I couldn’t write. Every now and then I need some motivation. He calls it kick, but I know he means literally 🙂 Well, with no inspiration, I tend to do what I did. Procastinate. Hope dully, that maybe tomorrow I would be stimulated enough to publish. Ah! But things take their own time to happen. Even a post. This bug is quite common with bloggers I hear. Every now and then I have blogger friends who disappear and then magically re-emerge. It’s a consolation. I am not the only one – I hear myself say. So, I put my feet up and bask in this self-imposed sabbatical. Waiting for things to happen on their own. peanuts and the masala make this dish what it is! 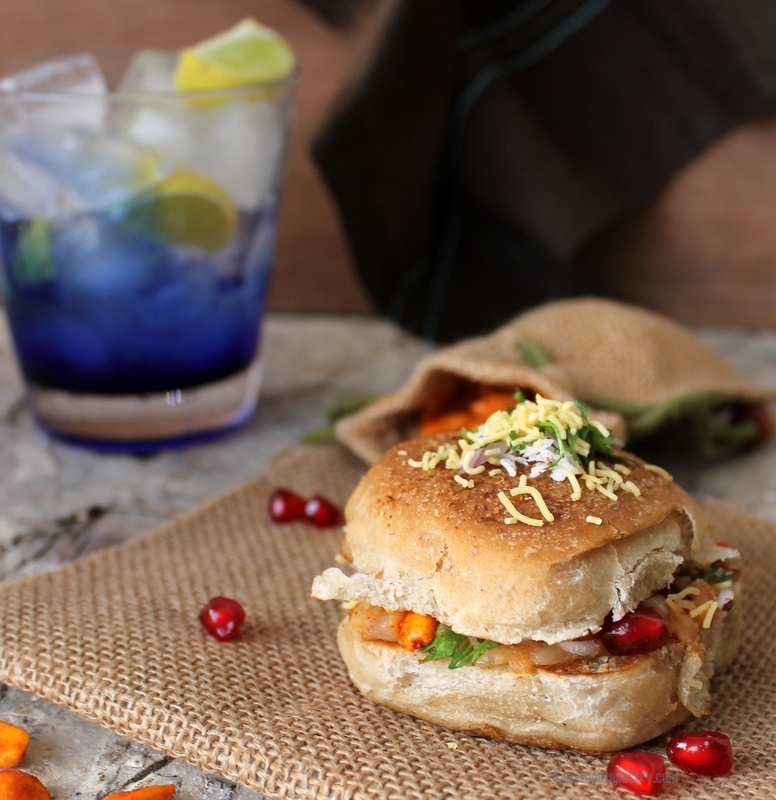 Dabeli. Spicy sweet crisp fun snack sold on the streets of Mumbai and Gujarat, this little guy has more fans than I could ever imagine. 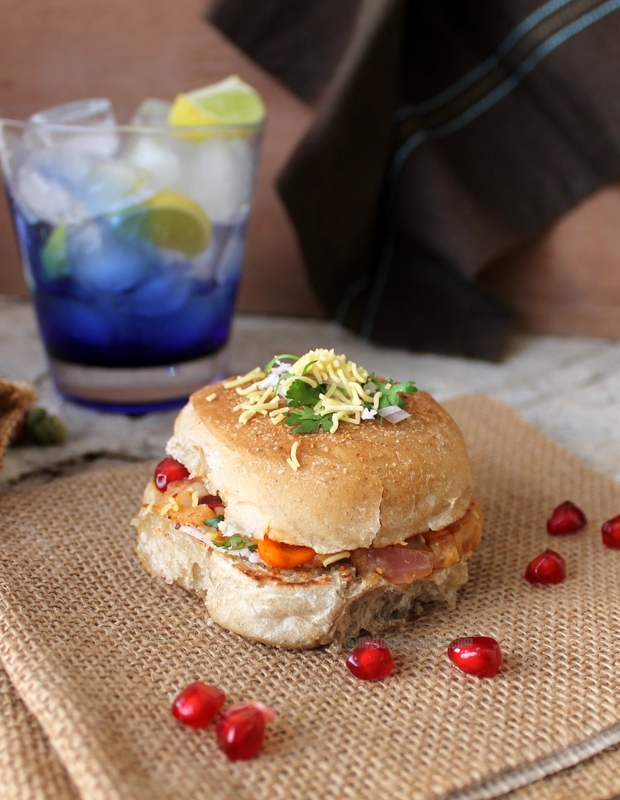 When you borrow the paav from the vada pav and steal some bhaaji from paav bhaji, decorate it with pomegranates, spicy peanuts and chutneys of various kinds, and finally sprinkle the highly aromatic dabeli masala, what you get is this crisp yet soft mushy paav meal which would satisfy those tiny hunger cravings. 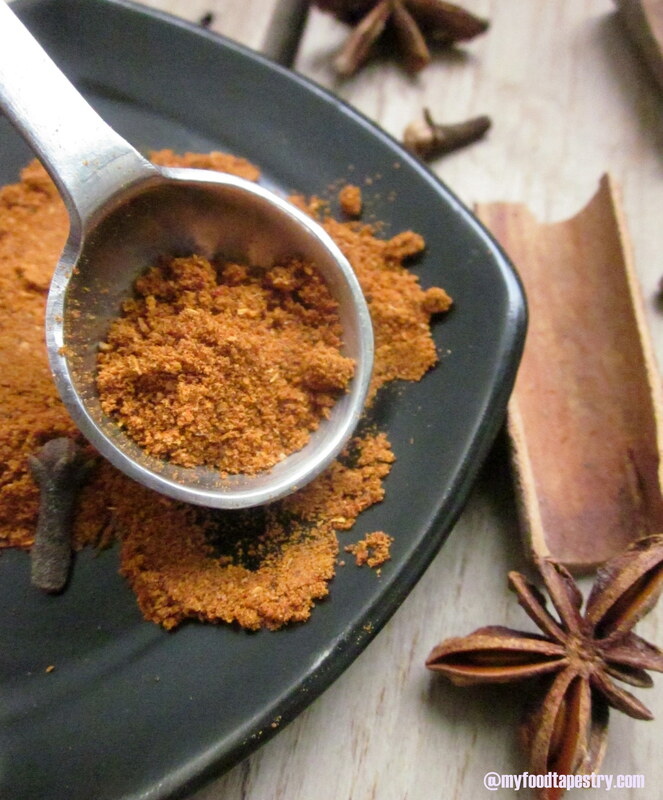 Making the masala at home is a breeze, but still if you don’t have the time or resources to do so, it is easily available in any Indian store. Now, like with any chaat/Indian street side junk, prepping this dish is elaborate, but assembling is fun and gets done in minutes. For the potato Mixture: 4 boiled potatoes-peeled and mashed, 1 onion-minced, 2 tsp dabeli masala, 1 tsp of oil, a pinch of hing or asafoetida, 1/2 tsp cumin/jeera, 2 tsp tamarind dates chutney, 2 tbsp coconut-grated, 2 tsp pomegranate. Water as required. 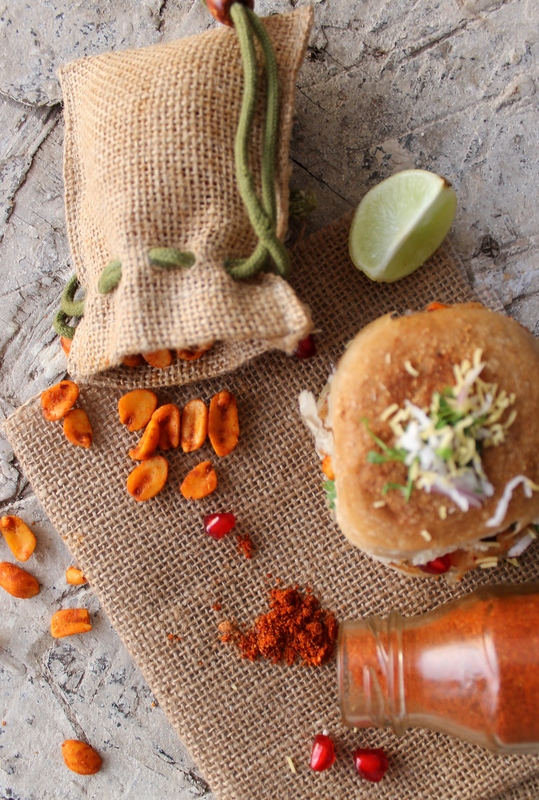 For the dabeli masala: Dry roast all the ingredients on a flat griddle or a pan for 3-5 minutes or until aromatic. Cool the spices. Grind to a fine powder. Store in an air-tight glass bottle and use as required. Note: I live in a very humid hot place so I usually refrigerate all my freshly ground masalas. So do as you deem fit. For the garlic chutney: soak red chilies in water for about 15 minutes or so. Grind the soaked red chiles along with garlic pods, salt and lime to a smooth paste. Use as less water as possible for grinding. For the potato mixture: Mash the boiled peeled potatoes roughly. Heat oil in a skillet. Splutter the cumin, fry onions till they turn pink. Sprinkle hing. 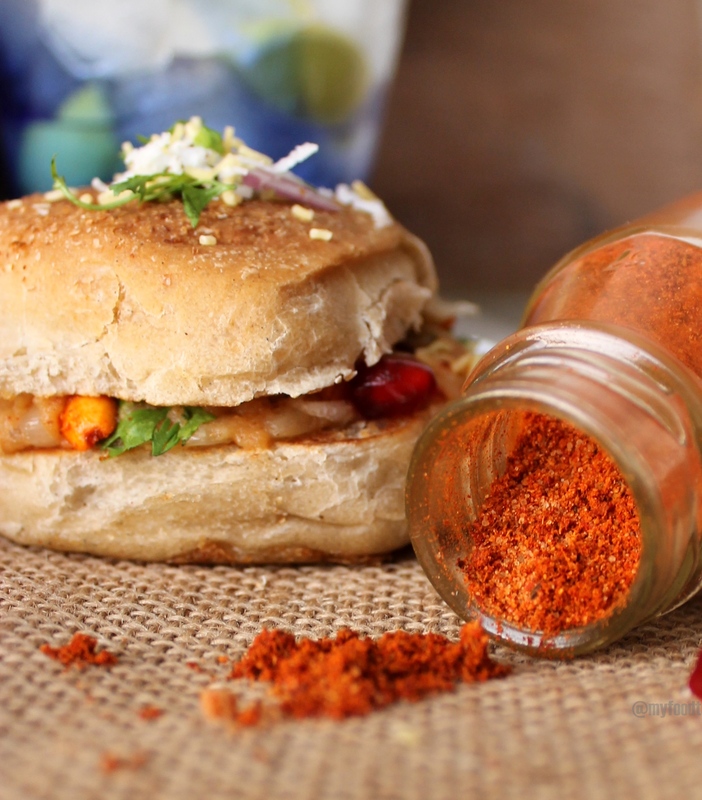 Now mix dabeli masala powder that you made in the tamarind chutney. keep aside. 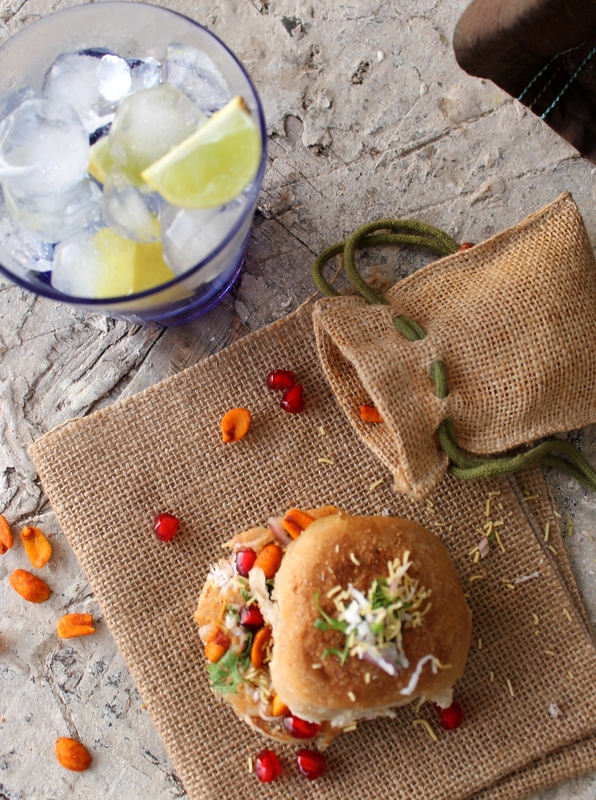 Throw in the mashed potatoes, Now add the tamarind dabeli masala mix. Season with salt. Get all the pan ingredients together. Mix it well. Spread this mixture in a shallow bowl of plate. 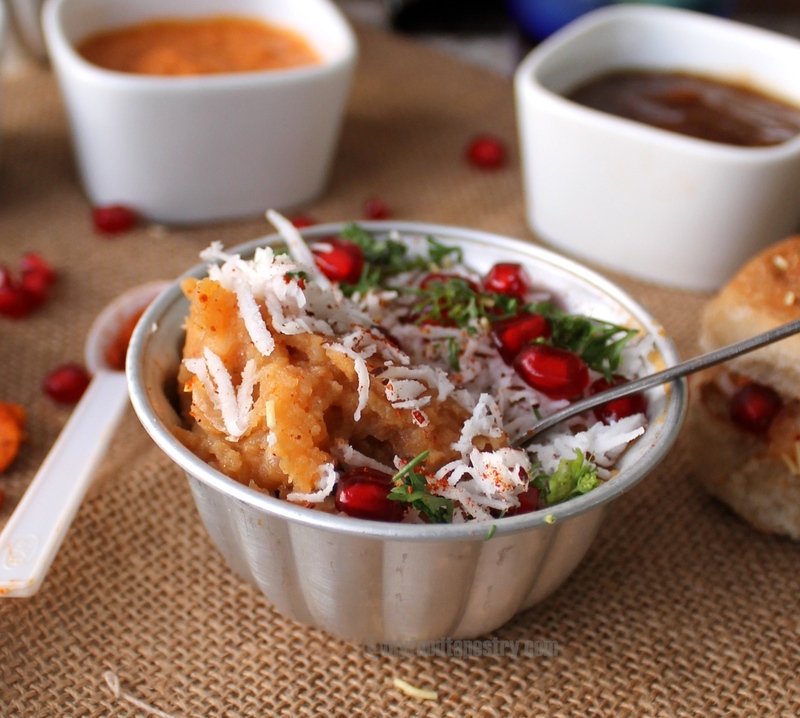 Decorate with grated coconut, pomegranate and coriander leaves. 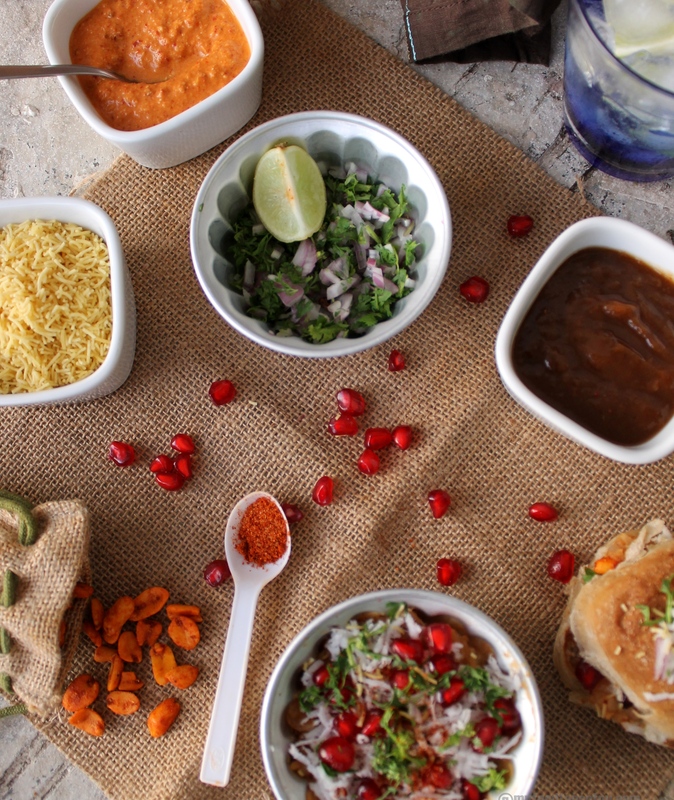 Use when you are ready to assemble the dabeli. Spread all your prepared ingredients on the counter top. Put a flat griddle on fire. Slice each pav into two equal halves. 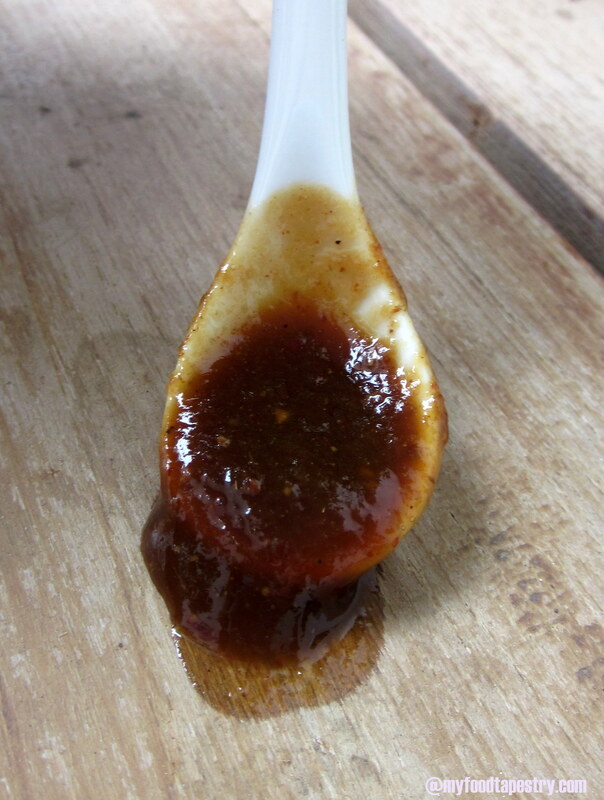 Apply garlic chutney on one side of the half, and tamarind chutney on the other side. Spread 1-2 tbsp of potato mixture on one side. 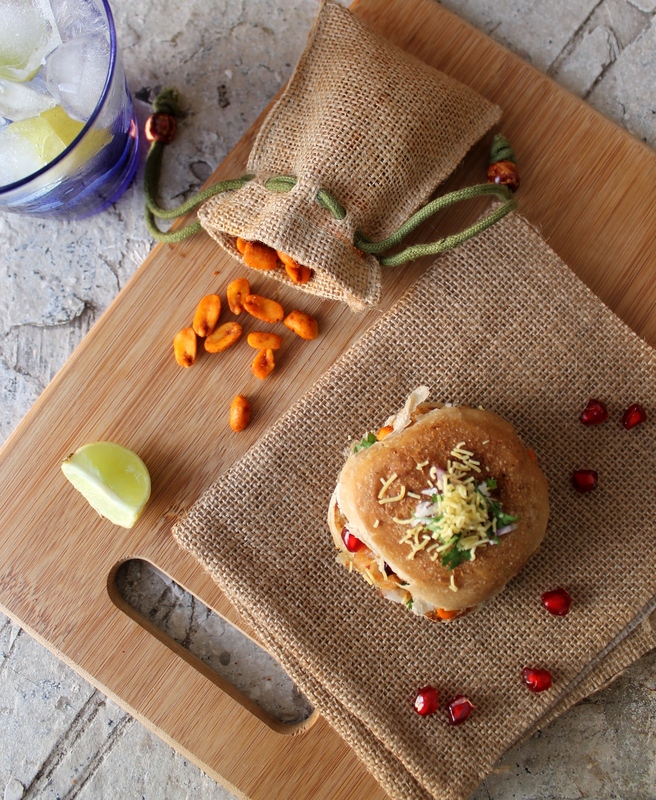 Top with chopped onion, coriander leaves, roasted peanuts, sev and pomegranate. I even added some more grated coconut! Close the entire assembly with the other bun. Roast lightly on a flat griddle using a bit of butter. Note: Its chaat! So you can tweak change substitute what you like and what you don’t accordingly! There is no hard and fast rule. 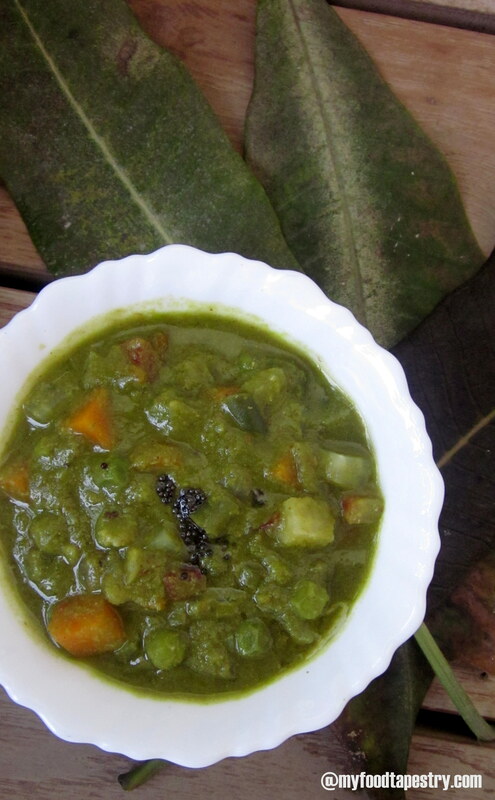 Those who don’t like garlic, you can replace it with mint coriander chutney. It works just as fine. Contributing to Angie’s Fabulous Fiestas is always a pleasure! Am taking this Indian yummiliocus chaat to her 41st!! Come, take a peek. You are gonna love all that you see! The food fever has caught on. Baklava and hummus was always a rage, and as people are turning more global, the wonder delights of any new cuisine follows. Lebanese is my latest viral. 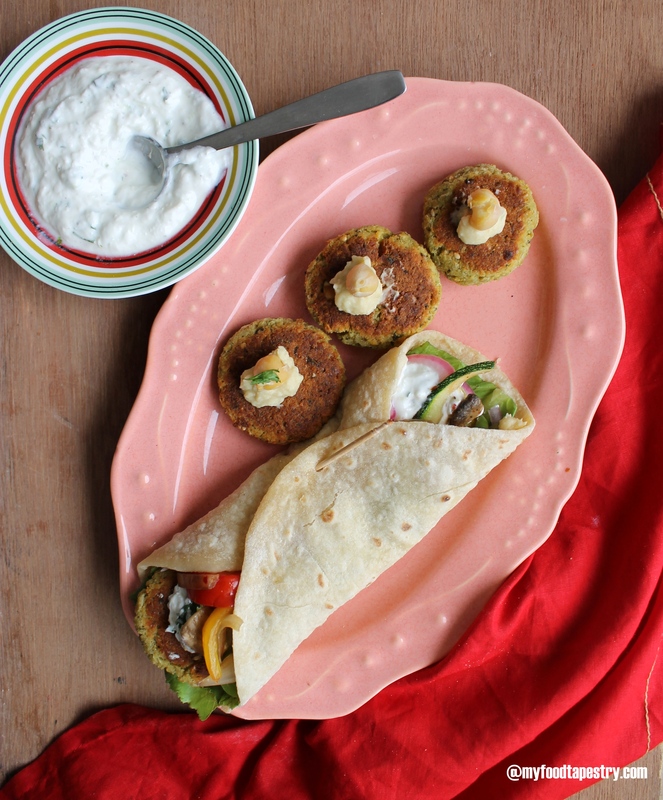 After my tryst with baking pita, next on the list was Falafels. The baked version. I’ve made them before but a baked one was to be my experiment. I waited for a Sunday. A rainy dull gloomy beautiful sunday which wrecked the cable connection, home bound the inmates and re-ignited the love for board games. They removed a new one, in spite of me yelling not to. But the rapid commencement of outwitting each other at word formations, though mainly with my help, was contagious. Along with grinding chickpeas, rolling dough and chopping vegetables, my mind raced to form words! The joy of letters. Inexplicable. 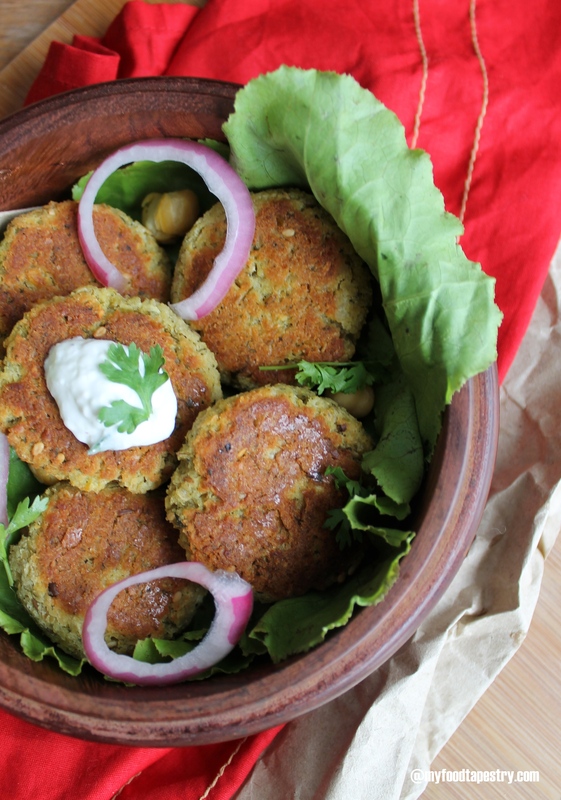 Falafels are small round deep fried bullets made from highly spiced chickpeas. But if you want to ditch the oil, we bake or roast them on a griddle and it works just fine. 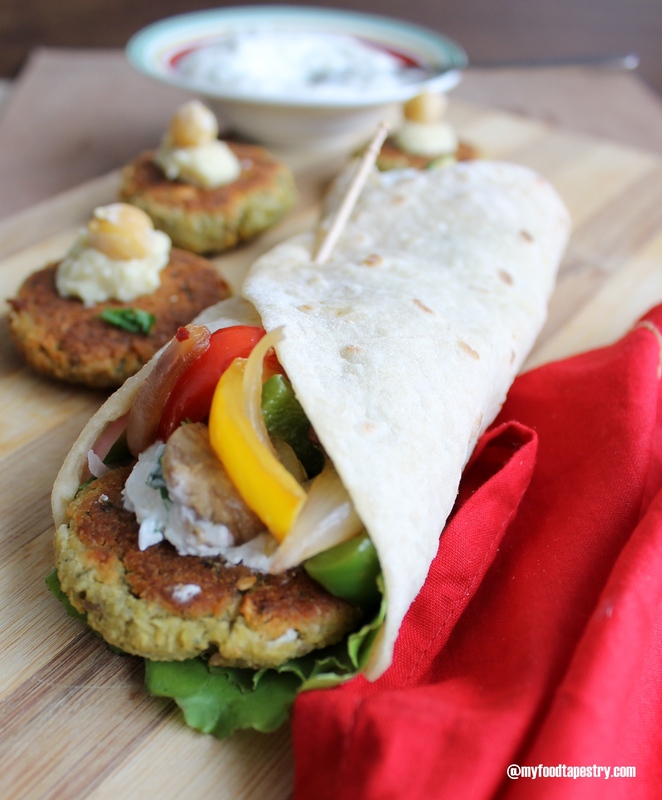 A wrap with these spicy bullets, a bit of hummus, some tzatziki and grilled veggies makes any meal complete. 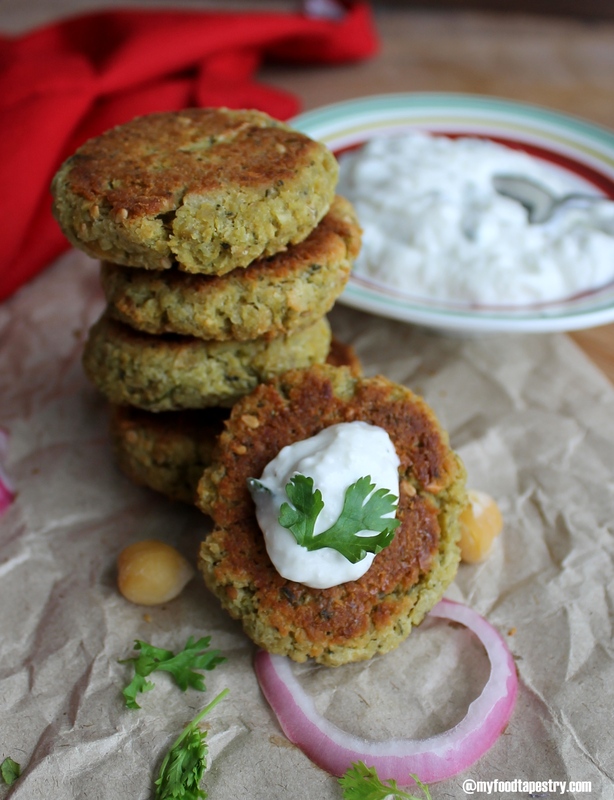 A bit of planning is required, the chickpea need to be soaked for 6-7 hours and you need hung curd to make tzatziki. So yes, please plan and initiate. 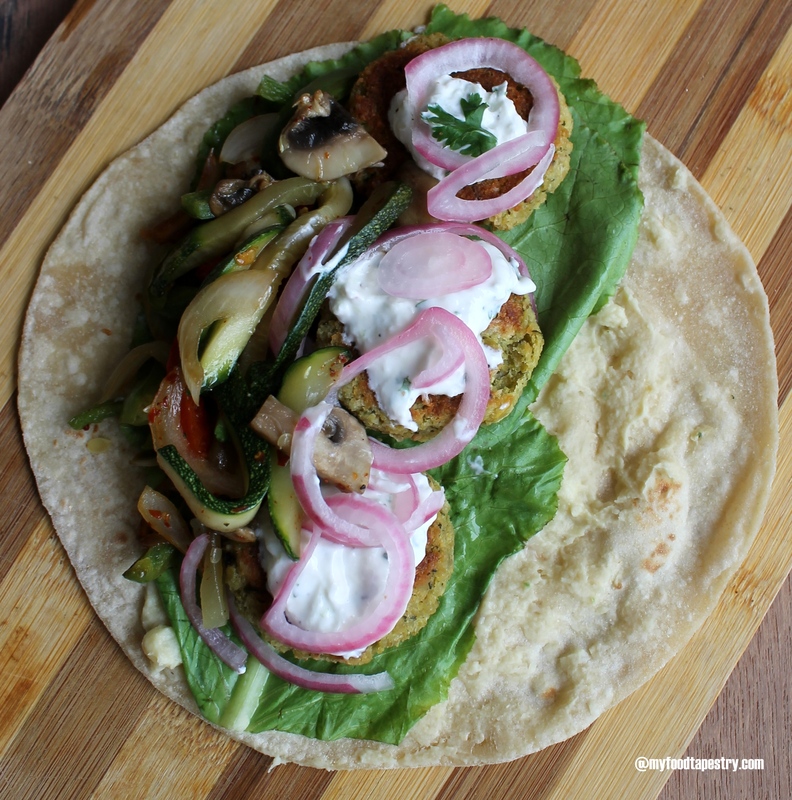 18/20 Falafel bullets or discs or patties, recipe below. 6 tbsp of grilled vegetables, I used mushrooms, zucchini, coloured peppers and onions. 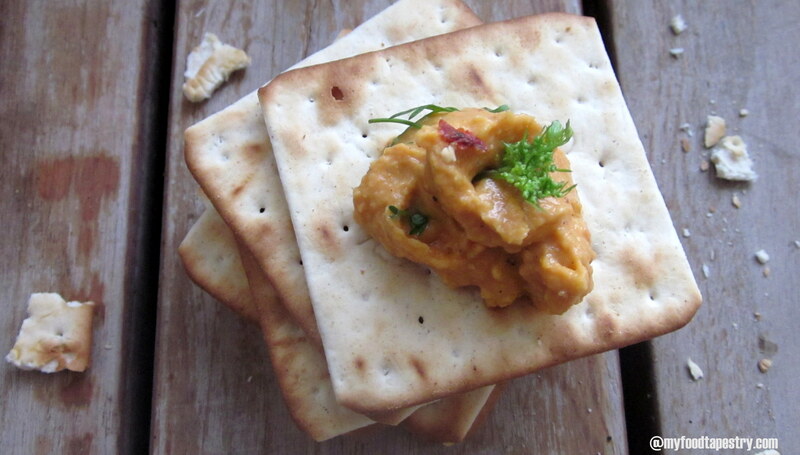 Take each tortilla, spread one heaped tbsp of hummus on it. Place torn lettuce leaves covering half the tortilla. 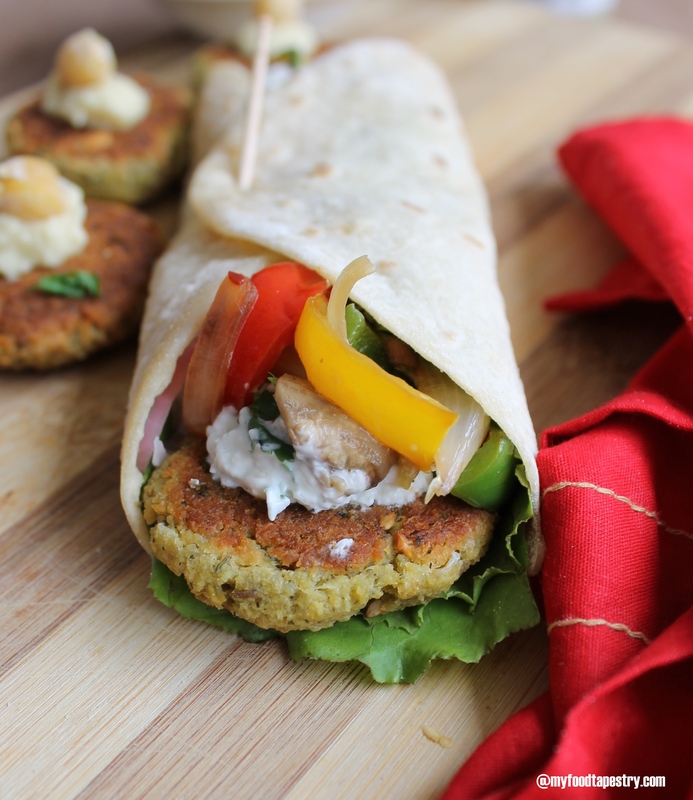 Now place 3 or 4 falafel discs in a straight line in the middle of the tortilla. 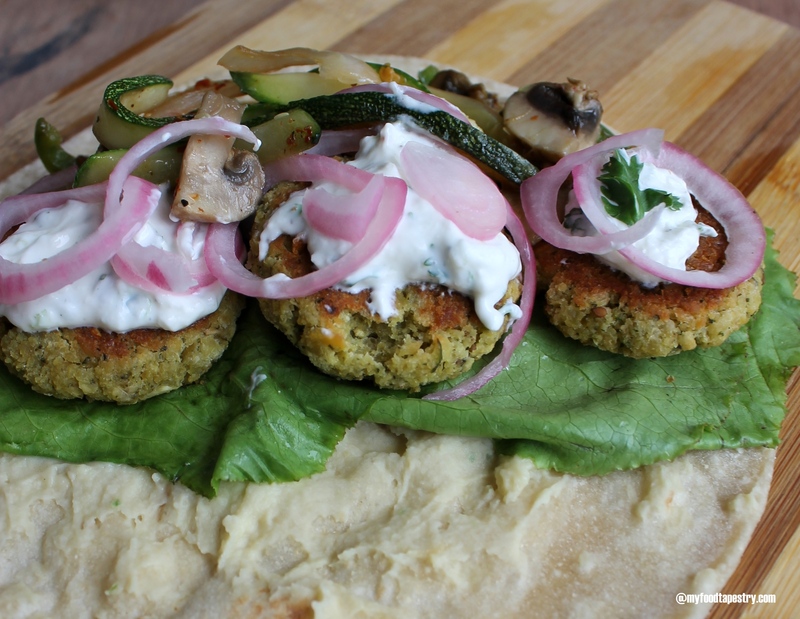 Drop spoonful of tzatziki on the cutlets. 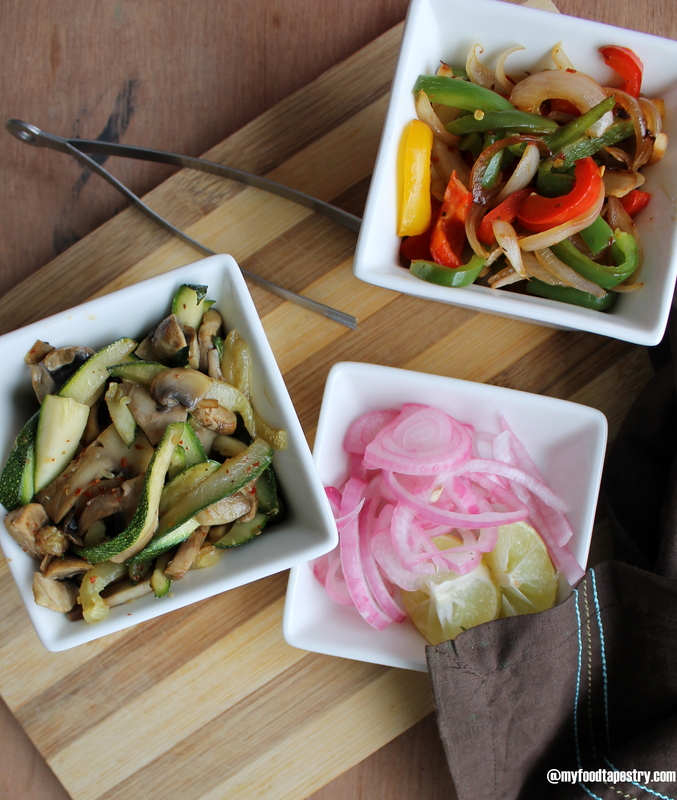 Place grilled vegetables and pickled onions. Sprinkle lime juice and chaat masala. Cover both sides. 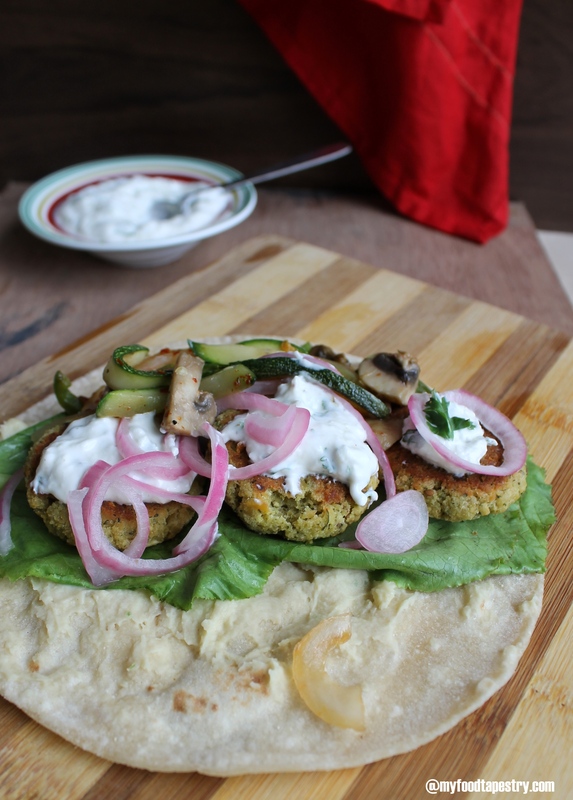 Grill on a flat griddle/tawa if desired or serve as it is with more hummus and tzatziki by the side! Put all ingredients in the mixer, except flour/maida, baking powder and sesame seeds. Coarsely grind everything till everything is mashed yet not very smooth. Do not add any water. This is very important because you don’t want your splitting cutlets. Once done, remove. Mix in the flour, baking powder and sesame seeds. Shape small balls of the mixture, flatten them slightly to form discs. Place them in a box or on a tray. Refrigerate for 2/3 hours. This step is crucial if you want firm well shaped falafels. Especially if you are deep frying them. Once well chilled. Pre heat your oven to 175C for 10 minutes. Grease a baking tray well with oil. 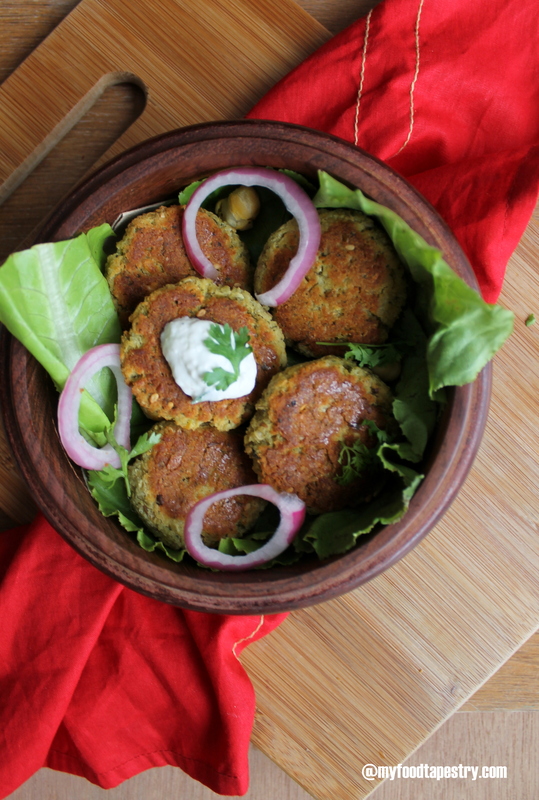 Take each falafel discs, slightly coat them with oil and place evenly on the tray. Bake for 8-10 minutes then flip and bake the other side for another 5-7 minutes. If you do not want to bake or deep fry, then you can roast them on a non stick pan with a bit of oil till the sides turn golden and crisp. This works beautifully but uses a bit of more oil than baking. Remove and use as required. Note: Deep frying produces the best results. They are crunchy out and soft inside. But baking works well too, so please don’t forget the baking powder. It helps the cutlets with soft insides. Note: Original recipe did not add any green chillies or mint. 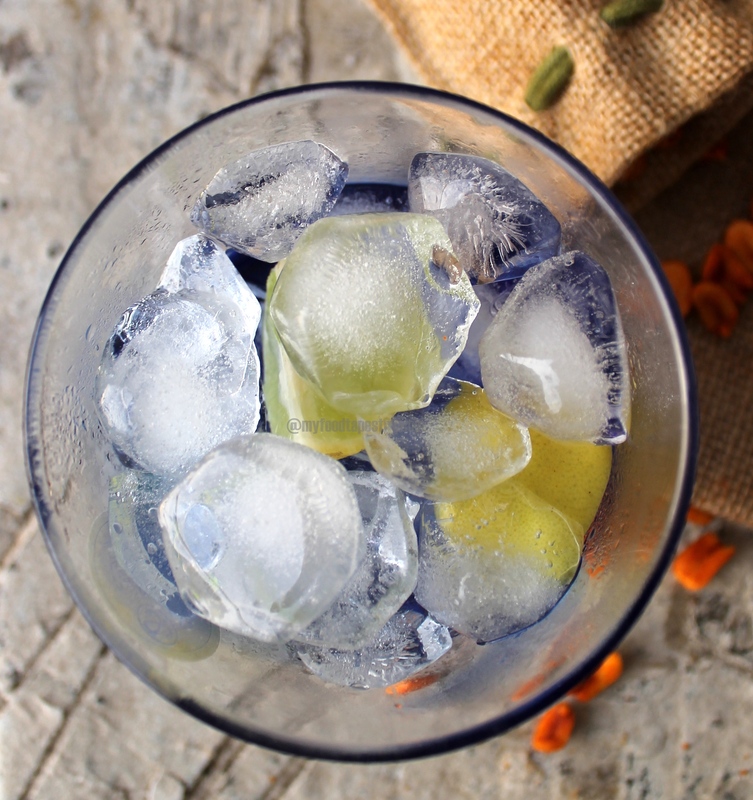 I used them generously because we love the flavour of mint and heat from the chilies. You can avoid them if you like. 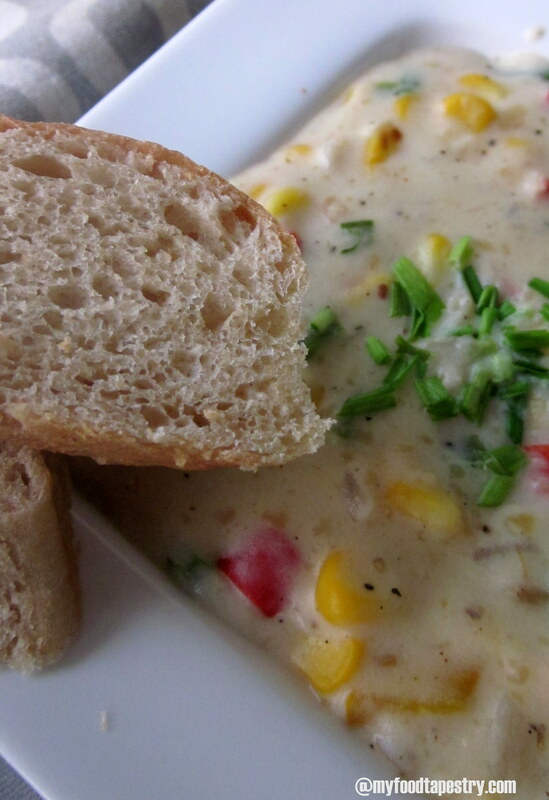 For the Veggies – Julienne all the vegetables. I used zucchini, mushrooms, coloured peppers and onions. In a tsp of olive oil, sauté them till 3/4th done. Season with salt, pepper and red chill flakes. For the Pickled Onions – soak sliced onions in 1/2 cup of vinegar, juice of 1/2 a lime and some salt. Keep aside for an hour. The colour of the onions and solution changes to pink. 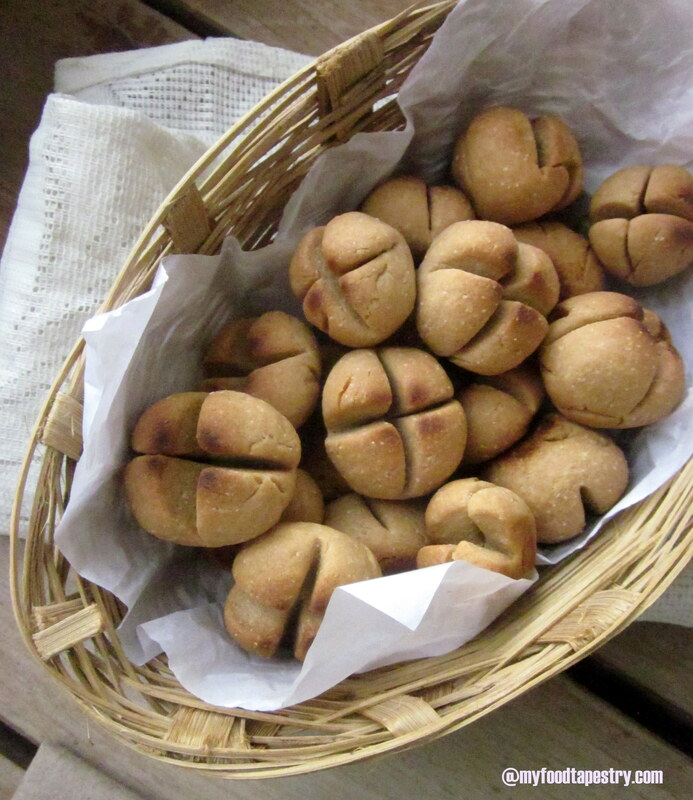 For the Flour Tortillas – Take half and half wheat and all-purpose/maida four. Season with a bit of salt. Knead using half n half milk and luke warm water. 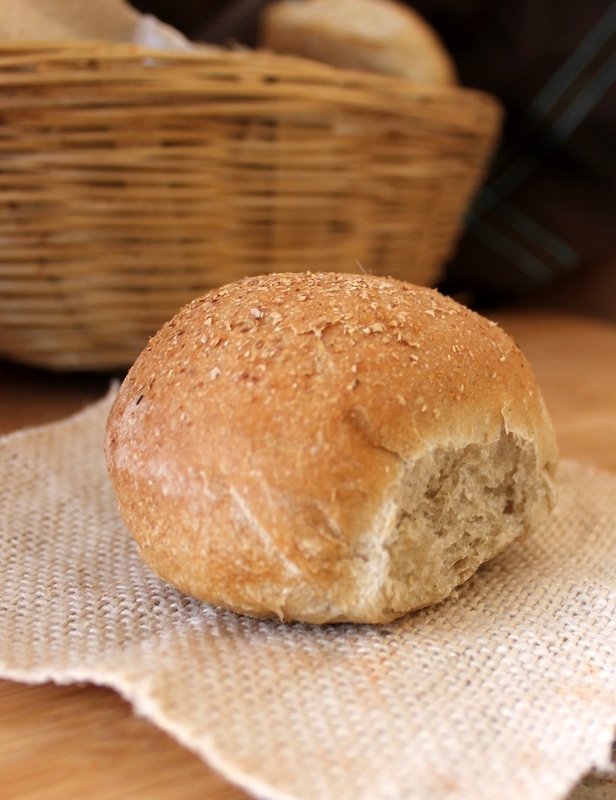 Knead well. Keep aside covered for at least 30 minutes. Then grab portions of dough, roll into thin flat rounds, roast both sides on a hot griddle. You can make them before hand and use as required. As you must have noticed, I put more pictures here than in any of my posts. Well. Thats because I took so many!! And then, spent almost half a day editing them. So they had to be used. don’t they? My entry to Angie’s Friday Fiesta #27. A must see for many more gorgeous mouth watering entries! Since I am not a fan of chaat especially this one, I hardly ever make it. You know how it is, when we cook things that usually we like and somehow forget to make that we don’t? Does it happen to you? Unconsciously I was doing that. I cook what I crave to eat. 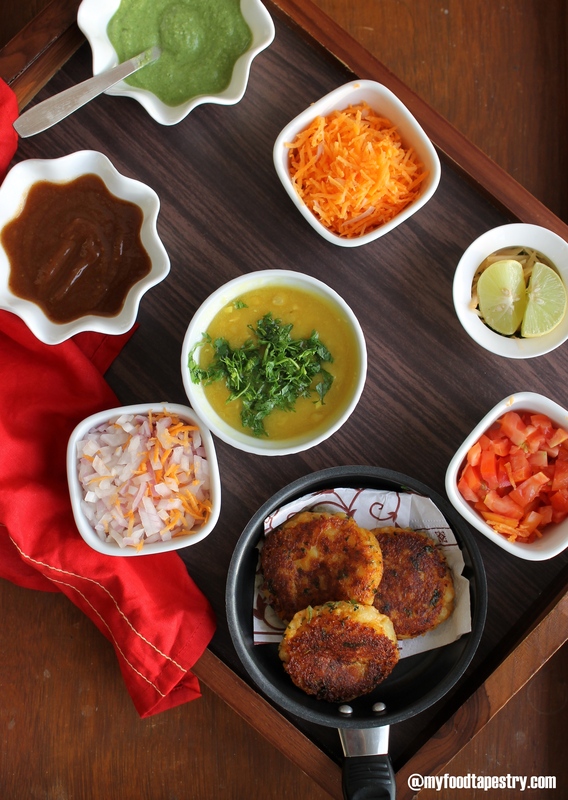 And chaat, a medley of deep fried crackers and vegetables and lots of Indian fried junk, all infused with sweet, spice and sour – is not on my list. Yea, I know I’m insane. Almost everyone I know love it! I don’t know how I missed the bus. I once had a 60 year old friend visiting us from San Fran and he asked for pani puris. I was like.. will you be able to take the heat?!! He enjoyed every morsel while I skeptically held a bottle of bisleri ready for him. This so called snack requires so many little things that most people I know eat it for a meal rather than a refreshment. It takes hardly any effort to put it together.. that is, once you have all the stuff with you. A bit of planning, a bit of prepping and you can make this in no time! 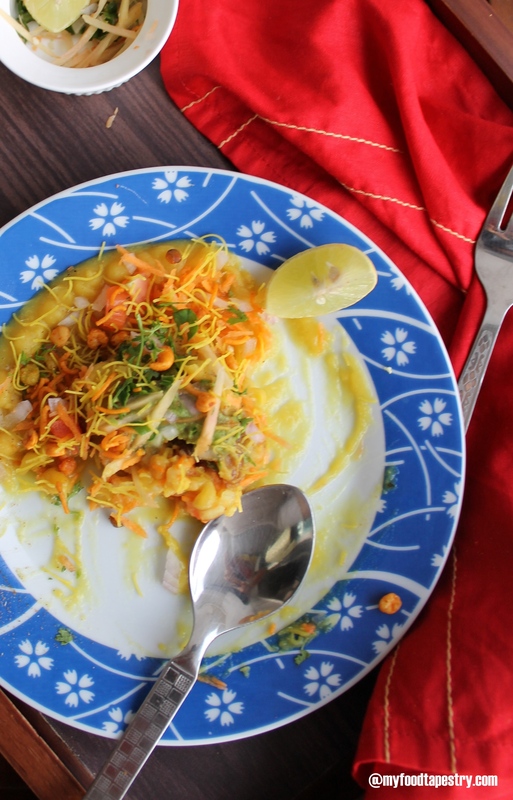 Yet, I thought of this yummy tangy sweet plate of chaat after ages… I simply forgot about it. Well, this one is his favourite, he really likes any chaat. Especially Mumbai street food. So he was in for a surprise when the answer to his mundane whats-for-dinner was Ragda Pattice. The name’s intriguing. 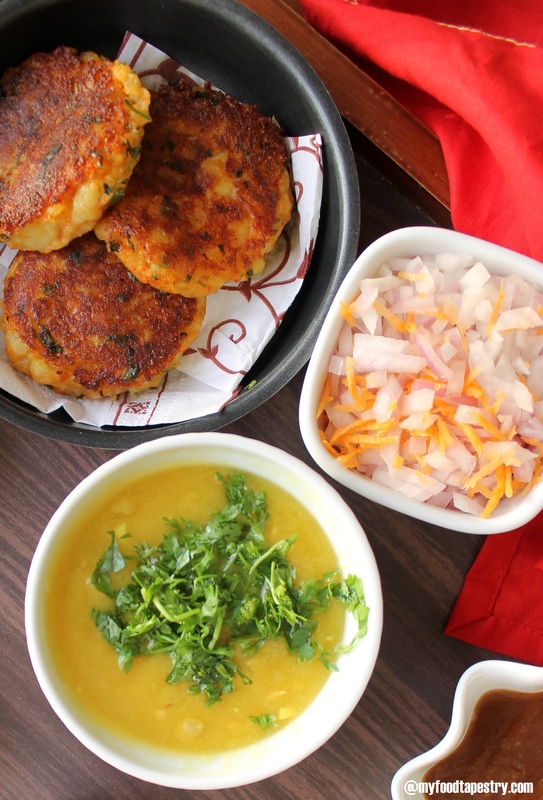 Essentially, deep fried potato cutlets(-the pattice bit) are dunked in a yellow dried peas gravy(the ragda), topped with tamarind chutney, green mint chutney, chopped vegetables and garnished with lots of thin fine sev and coriander leaves. Instead of deep frying the cutlets, I chose to add a bit of cornflour and sauté them with a tsp of oil on a non stick pan. It works just fine. She had it for the first time. Yes, no kidding! a bit of oil to roast them in a non stick pan. 1 cup dried yellow peas, soaked overnight or for 7-8 hours. 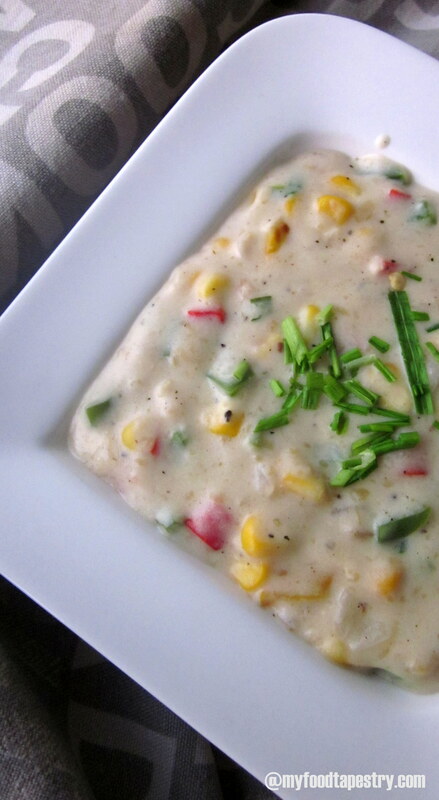 For the Pattice – mash the boiled potatoes, add salt, red chill powder, cornflour and coriander leaves. Mix and mash well. Then grab small handfuls of the mixture and make flat balls out of them. Preferable refrigerate for at least an hour. This makes the batter firm and the end result crisp. When ready to use, heat a pan, add a tsp of oil. Roast these cutlets till golden brown and crisp. Note: Cornflour is the magical ingredient! It binds and prevents from splitting the patty. 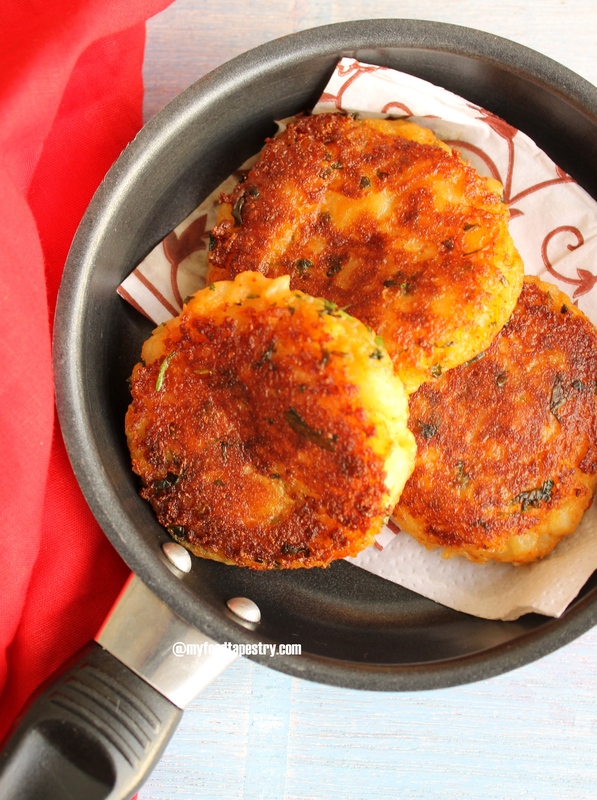 the crunch in the cutlet is enhanced by refrigeration and the cornflour. Note: You can deep fry them if desired, in which case, to prevent splitting, add a slice or two of crushed bread and definitely refrigerate for a couple of hours. Note: You can bake them too! 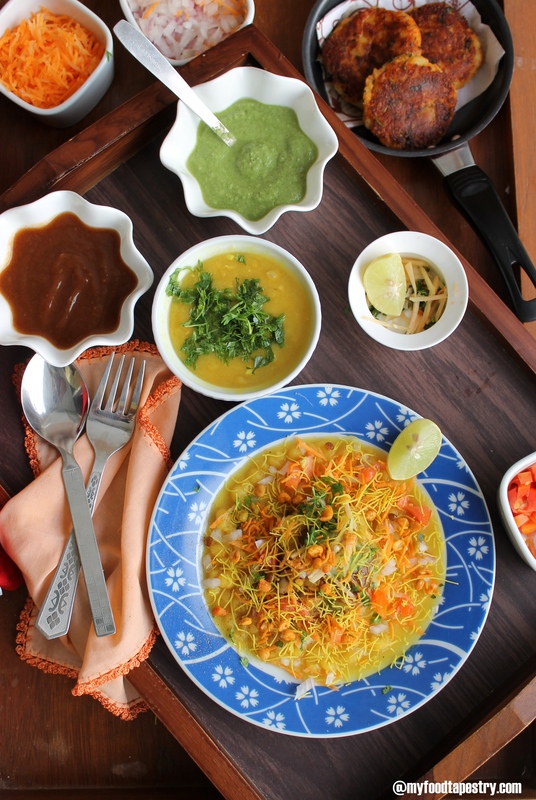 For the Ragda – Boil the yellow pea with 3 cups of water, salt, turmeric and crushed ginger garlic. I pressure cook the peas. Its faster. If you do not have a cooker, boil them in a covered pot till mushy. Since dried peas/beans are major defaulters in hindering digestion, I would suggest soak and then boil it well. Usually not-properly cooked beans or pulses cause a lot of gas and discomfort. Note: I use the boiled ragda as it is. But some people add a tempering of oil, mustard seeds and curry leaves. 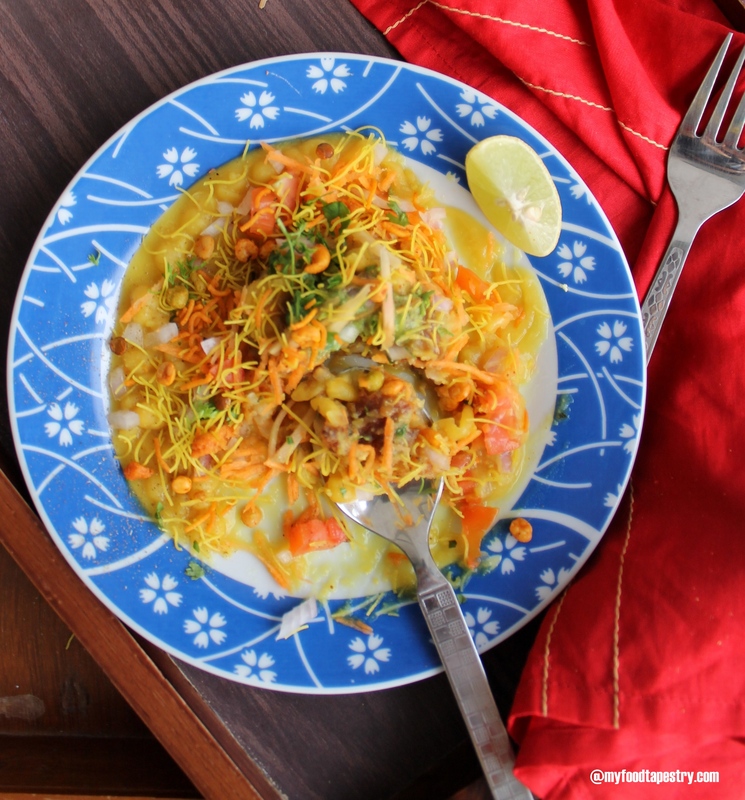 Note: Ragda can be eaten as it is, top with the chutneys and chopped onions, tomatoes and finish off with a bit of lime and chaat masala. Its like a thick tangy sweet spicy stew! In Mumbai some enjoy it with a piece of pav or dinner roll. 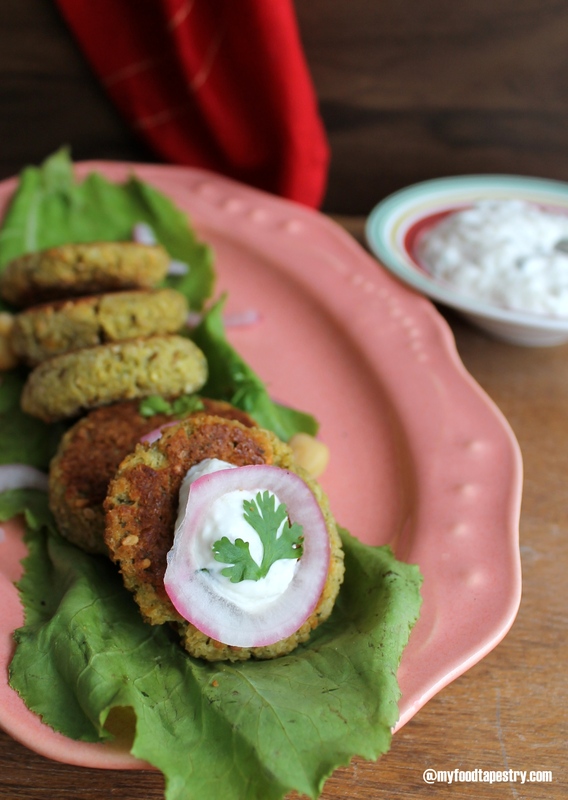 Place 2 cutlets on a plate, pour 3/4 tbsp of ragda over it. Drop a tsp of green mint and tamarind chutney each. Dot with chopped onions, tomatoes and grated carrot. If using julienne ginger, add now. Sprinkle chaat masala and a squeeze of lime. Garnish with chopped coriander leaves and sev. Note: Potatoes and dried peas are highly gaseous and not so easy to digest. So I usually add a lot of raw julienne pickled ginger. I am taking this to Angie’s Fiesta Friday #26. Do take a peek to see other awesome entries all in one post. ‘Go seasonal’, I can almost hear her saying this. Her words ring every time I’m in a market. My grandmum always bought produce which was in season and available in plenty. She never went looking for stuff that was ‘there when it should not be’. 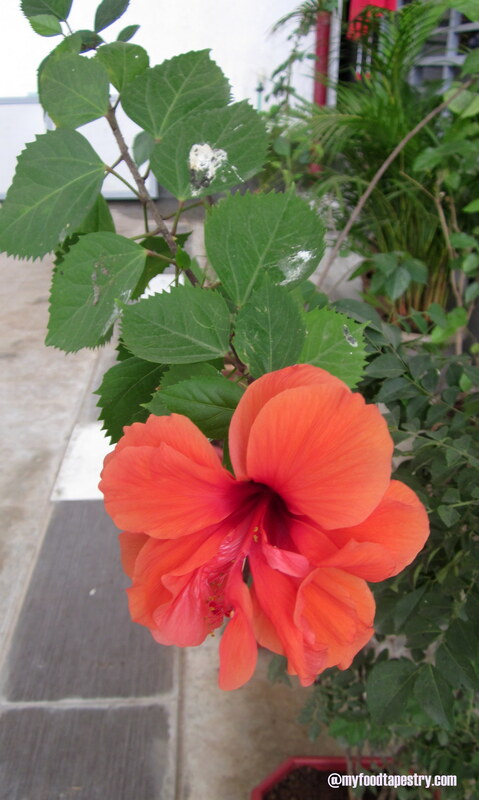 For one they are grown naturally, not adulterated or processed. Hence they are more nutritious, less expensive and of course simply yummy! Now, winters being my most favorite season, comes armed with a host of gifts. Fresh colorful fruits and vegetables hound the market. The wares sit gleaming, uninhibited and inviting in all their natural glory. I usually go mental in times like these. Making it a point to try most of the produce finds me visiting the farmers market every other day. 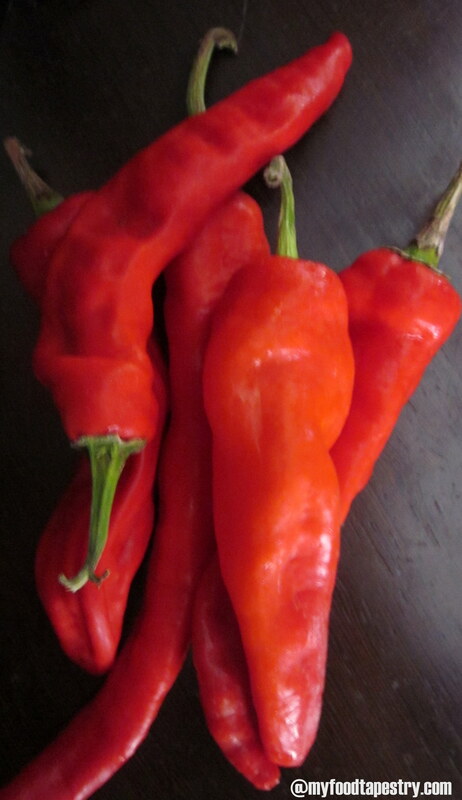 So on that note, I introduce to you fresh red whole chilies or peppers. They are pretty to look and not very hot at all. You can do so much with them! Like make poppers or dips or pickle them or add them in your rice, make hot sauce.. I treated them like red bell peppers, threw some into my fried rice, once simply sautéed in oil and spiced it with turmeric, salt and coriander powder(yummy! 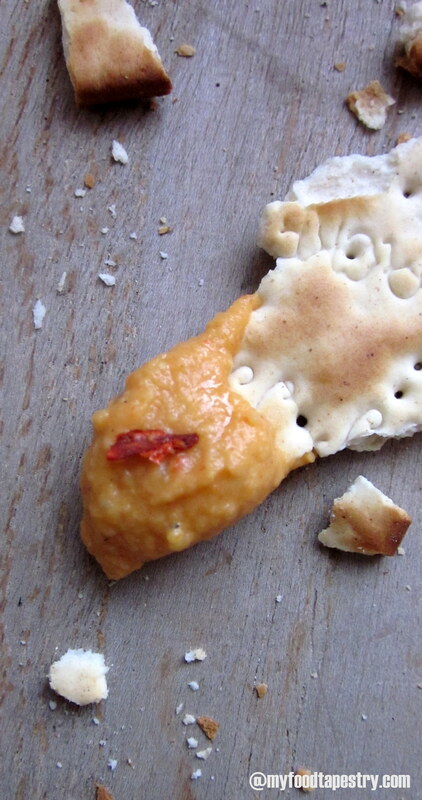 ), made some roasted pepper hummus and a creamy corn red chili dip. Wanted to make poppers but found no takers for it, slit red peppers, stuffed with a creamy potato filling, topped with some cheese and baked till golden – sounds ethereal right?! Um.. not to guys back home. Well, I stuck to dips and other usual stuff. We’ll save the poppers for some other time. 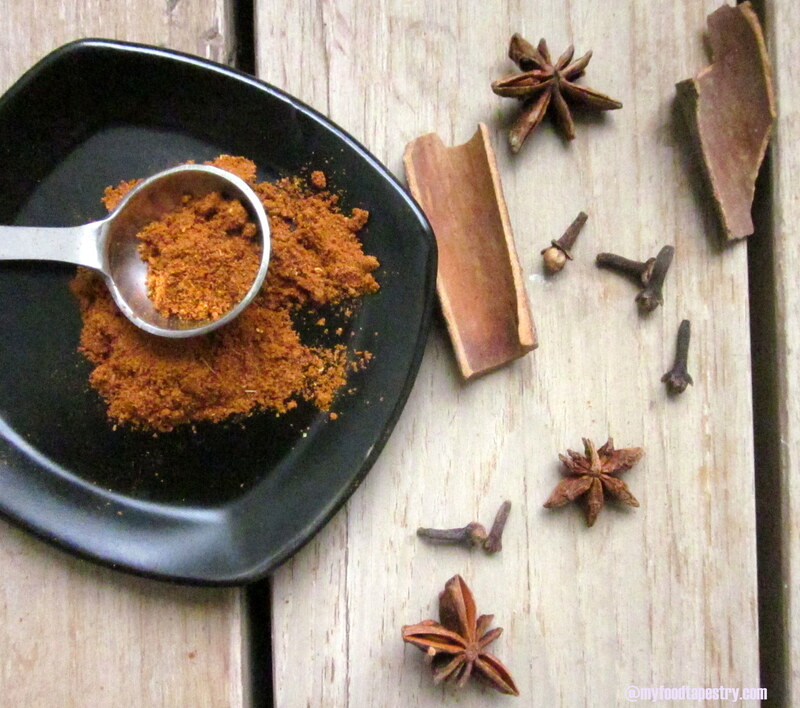 Cayenne pepper – 1/2 tsp – to be used only if the fresh red chilies are very mild. Pressure cook chick peas along with the water until soft. Drain the chick peas and keep aside. Reserve the water also. Dry roast sesame seeds on low flame for 2-3 mts and turn off flame. Place a skewer into each of the red chilie peppers and roast over low flame till the skin is charred or blackened. Peel. Place the peeled roasted peppers in a bowl and keep aside. Heat a small pan, add 2 tsps olive oil and roast garlic for a mt till light brown. Turn off heat and cool. In a mixer grinder, add drained chickpeas, roasted red chilies, garlic, sesame seeds, olive oil, yoghurt and grind to a fine paste. Add lemon juice, cumin powder, cayenne pepper or chili powder and salt and grind again till well blended. It should be a smooth and creamy paste. Remove to a serving bowl. 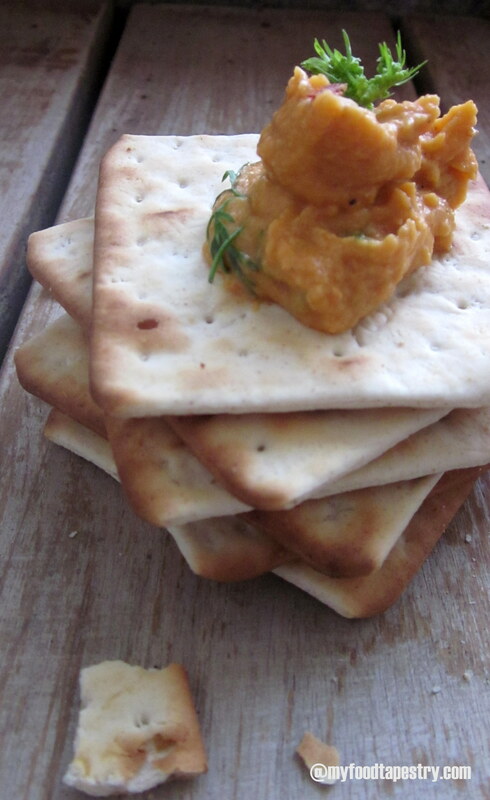 Drizzle some olive oil on top with a sprinkle of red chili flakes and serve with pita bread, crackers or sliced vegetables like carrot or cucumber. We snacked on it with some dry crackers and bread. Yummy! Heat oil, saute garlic, ginger, and onions till they turn translucent. Throw in green bell pepper, corn and red chili peppers. Fry well for a minute. Sprinkle flour. 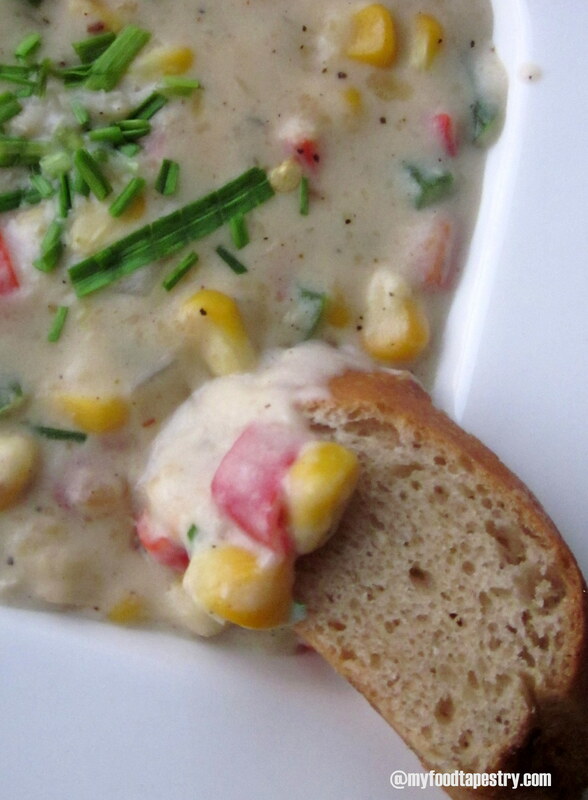 let it coat evenly, quickly add milk and keep stirring till the milk thickens into a creamy sauce covering the veggies. Add seasoning and salt. If using cheese, mix it in now. Give it a final mix. The consistency is that of a semi thick dip, like mayonnaise. Cool. 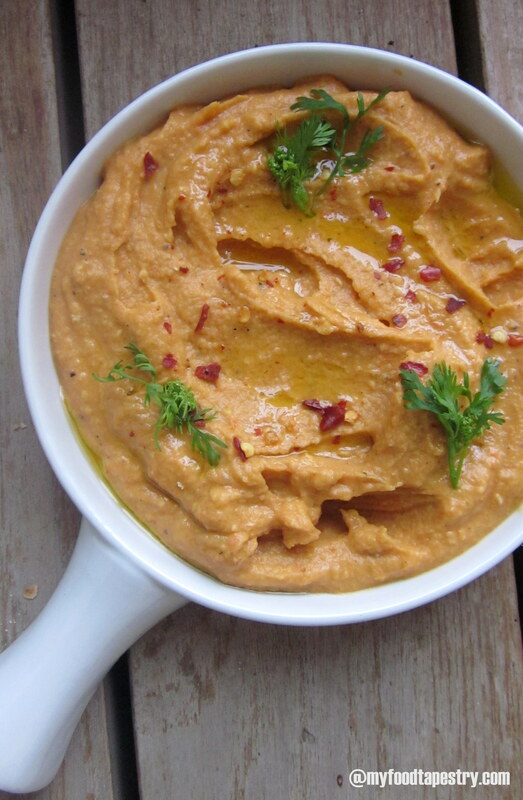 Serve it with crackers or toasted bread or with some pita. Try it in sandwiches or wraps. Yummy. Certified. So she is highly opinionated, fearless, immensely emotional(read: cry baby), scathingly critical but yet very very lovable. Amassing amma’s prized concoctions and her million dollar tips and tricks has always been on my never ending to-do list. If God had intended us to follow recipes, He wouldn’t have given us grandmothers. You can wake up, get fresh and walk into any of the innumerable number of darshinis and small restaurants for a heart healthy breakfast. 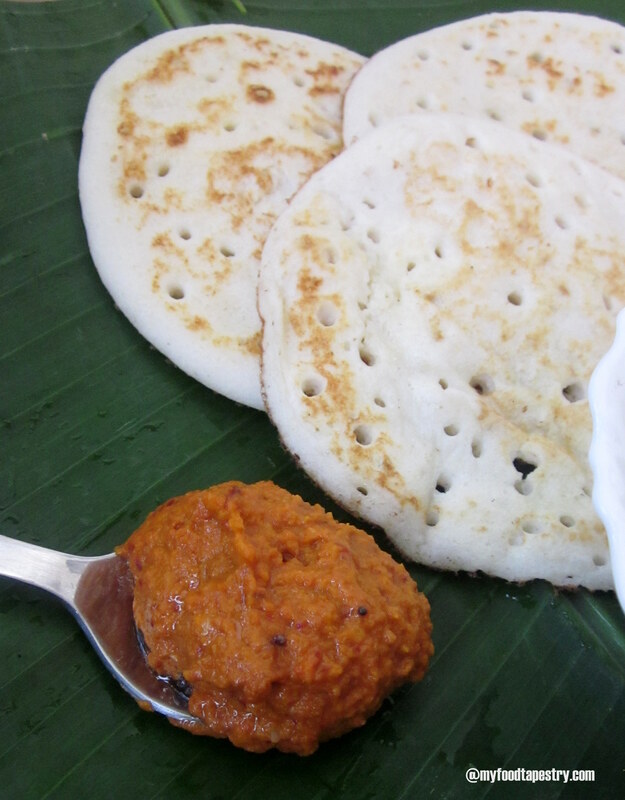 The countless udupi tiffin rooms(small eateries) offer delicious vegetarian food. 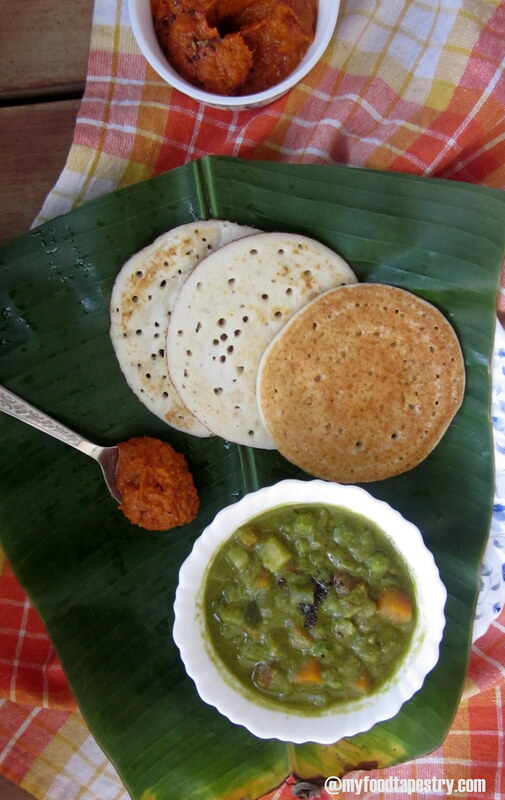 The ubiquitous Indian dish masala dosa has its origins in Udupi. I never realized how my taste buds were being pampered until I moved from Bangalore. Work, marriage, then again work has taken us to numerous countries and cities. But each and every place had one common grouse – no good appropriate place to break our fast. After an arduous morning run and a quick fresh cool shower all that he and me ever crave for is someone to serve us those delicious doses or rave idly along with the signature strong South Indian kaapi. 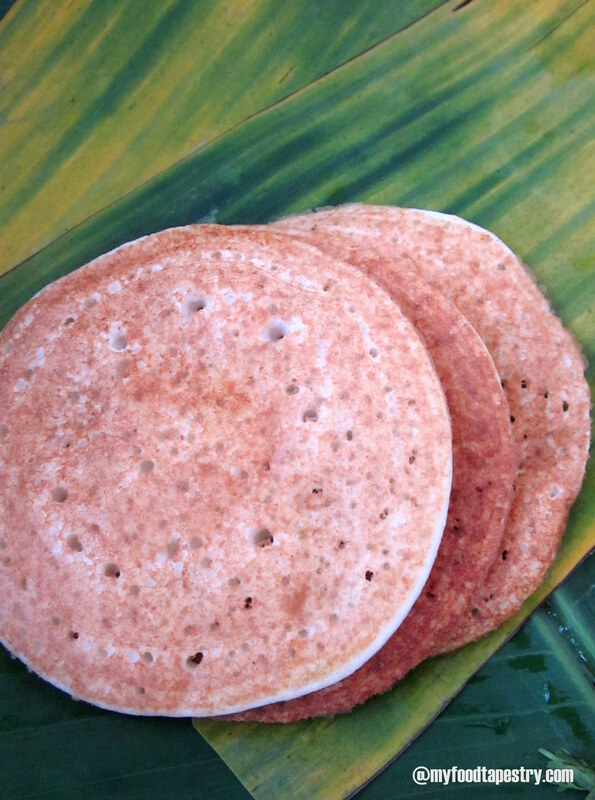 Set Dosas are soft, spongy fluffy dosas made with parboiled rice and beaten rice. They are usually served in sets of 3-4, along with a vegetable curry and some chutney. The batter though fermented is not allowed to turn sour, in fact a generous pinch of sugar is added to cut the sourness if present. Wash the rice urad dal several times in water. Soak the rice dal together for 5-6 hours. Wash the beaten rice thoroughly soak it in yogurt for 5-6 hours. Blend the rice, dal beaten rice together to form a smooth batter. Cover and keep the batter aside to ferment. Should take approximately 7-8 hours. Add salt, sugar to the batter, mix well. Heat a flat griddle, pour a ladle full of batter on to the hot griddle & spread very little of the batter gently. 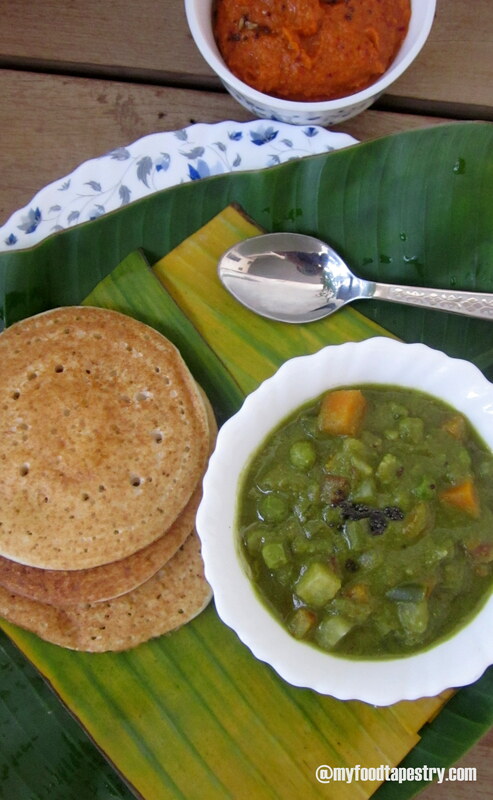 Do not spread the batter more as the dosa needs to be thick and should look like a pancake. If the batter is well fermented you will have many pores on the dosa. Pour ghee or oil around the pancake. Using a big lid cover the dosa and let it cook for about 30-40 seconds. Remove the lid, flip the dosa and cook on the other side uncovered. Ideally a set dosa is cooked only on one side, but just to ensure it is cooked well, we can also roast it from the other side. Prepare a couple of more dosas like this, serve with chutney and sagu. In a wok, heat oil. Saute red chilies garlic, onions till translucent. Then add tomatoes along wit salt. Cook till the tomatoes are slushy and oil leaves the sides. Cool the mixture. 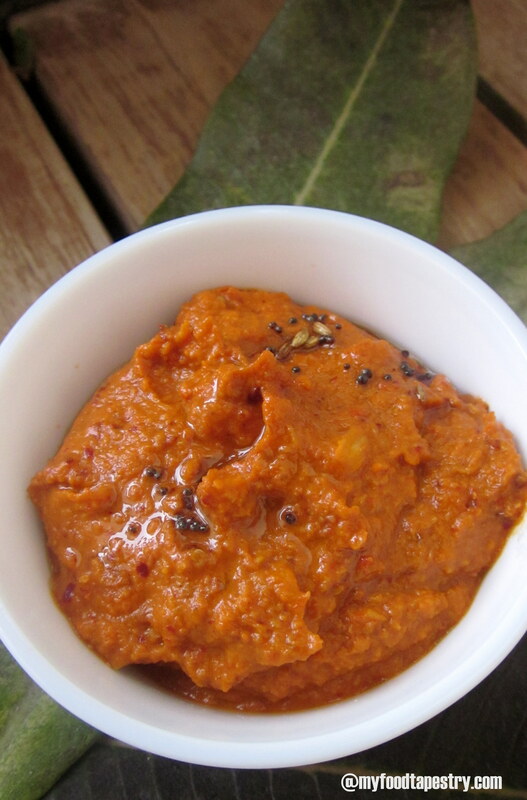 Along with the coconut, blend the entire onion tomato mix into a smooth paste. I like mine little bit chunky so I grind it to a coarse paste. For the seasoning: heat oil, splutter mustard seeds and add curry leaves. Pour this tempering over the chutney. 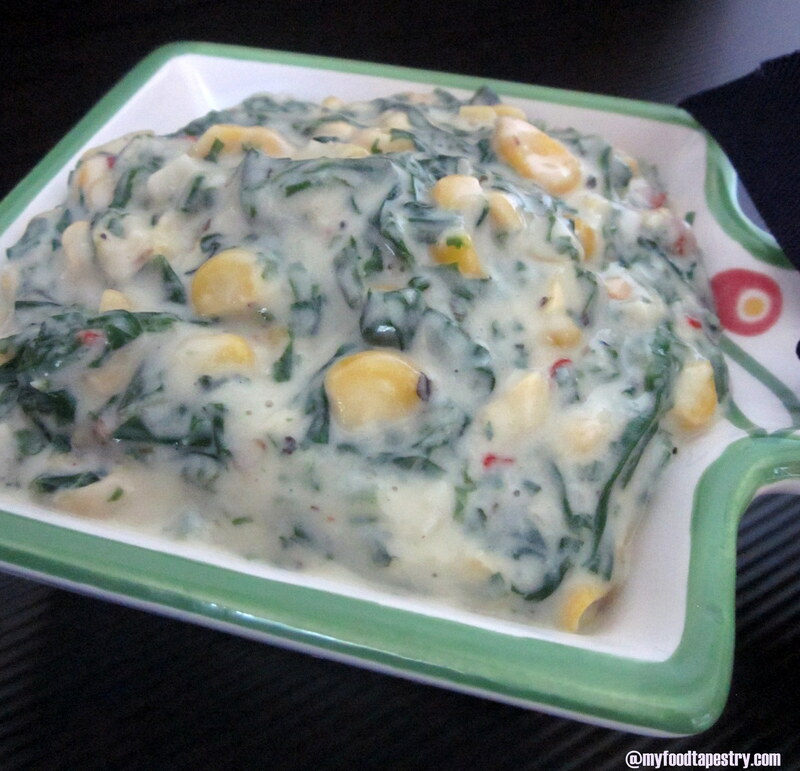 This creamy coconut based melange of vegetables has one special ingredient which makes the curry typical and delicious. 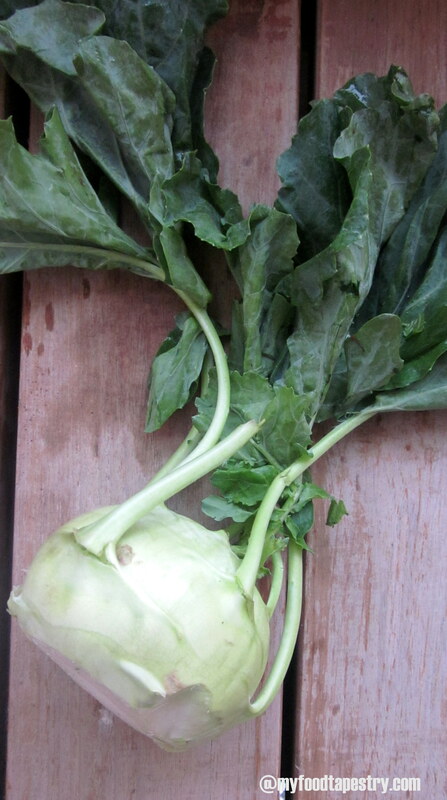 Knol Khol/Kohlrabi/Nookal/Alkul/Gedde Kosu or simply gaanth Gobhi, a cross between a turnip and cabbage is preferably used to make this curry. 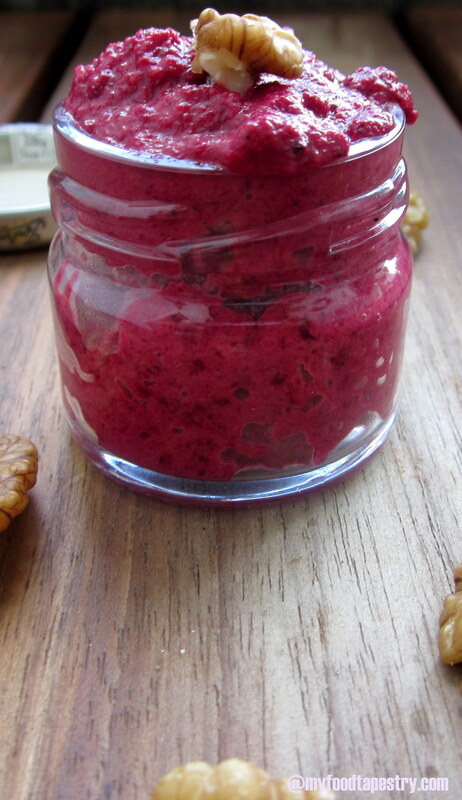 It is mildly sweet and succulent, abundantly rich in vitamins and dietary fibre. It is low in calories(yay!) and has a good number of minerals in it. Ideally this curry is pale cream colored, but coriander leaves and green chilies can be added to turn the color green. 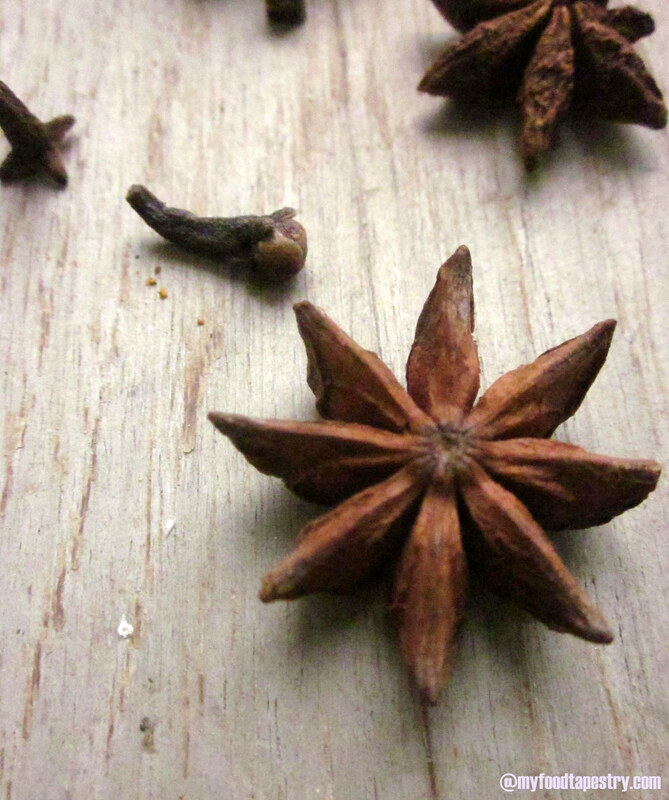 To be dry roasted: 2 tsp of coriander seeds, 2 tsp of poppy seeds, 2 each cinnamom and cloves, 2-3 red chillies. Optional: green chilies, ginger and coriander leaves, if you want your curry to be green in color. PaBoil all the veggies in little water seasoned with little bit of salt. Keep aside. 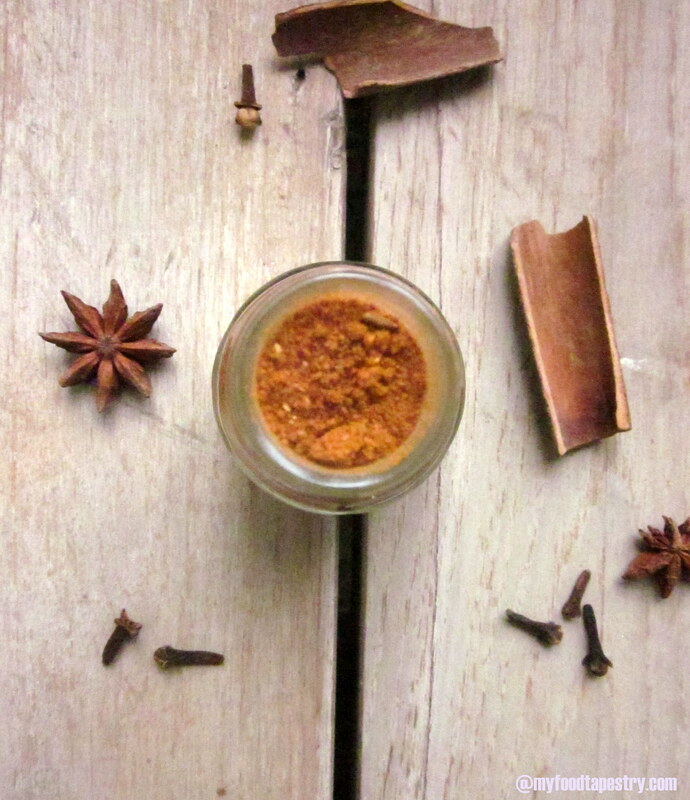 Make a paste of the dry roasted masalas along with dalia and coconut. Keep aside. In a heavy bottomed pan, heat ghee or oil. Saute onions and garlic till they turn pinkish. Then add capsicum. Saute for a couple of minutes. Throw in the ground paste and cook well till oil leaves the sides. Add tomatoes and the par boiled vegetables and simmer for 6-8 minutes until all the veggies and gravy comes into a homogenous mix. Serve hot with dosas or pooris. 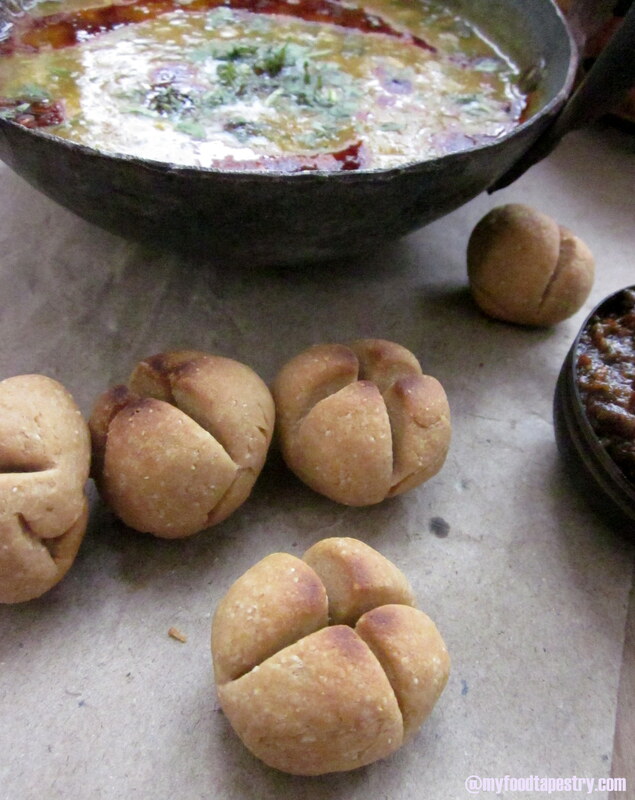 Rajasthani Gourmet Delight – Dal Baati, my Skinny Version! Rajasthan literally means “Land of kings”. The largest state of India, boasts of the great Indian desert in the midst of it. Culturally rich, folk music, dance and of course food holds a special place in the heart of every Rajasthani. Rajasthani cooking was influenced by both the war-like lifestyles of its inhabitants and the availability of ingredients in this arid region. Food that could last for several days and could be eaten without heating was preferred. 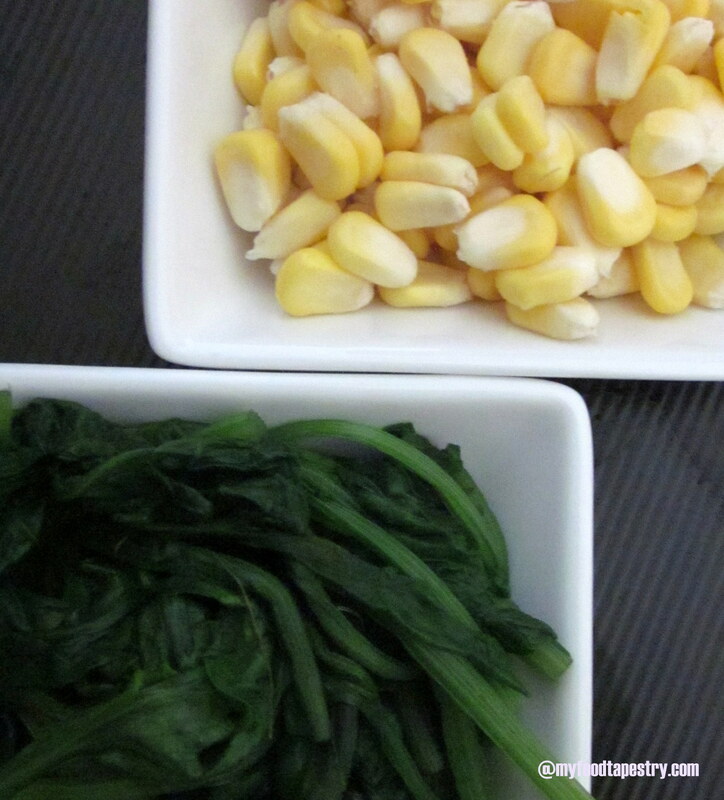 Scarcity of water and fresh green vegetables have all had their effect on the cooking. But now with technology nothing is scarce any more and you get everything everywhere at any time. So although you will find excessive use of lentils and pulses in their food, fresh vegetables has found its way into their thalis too. 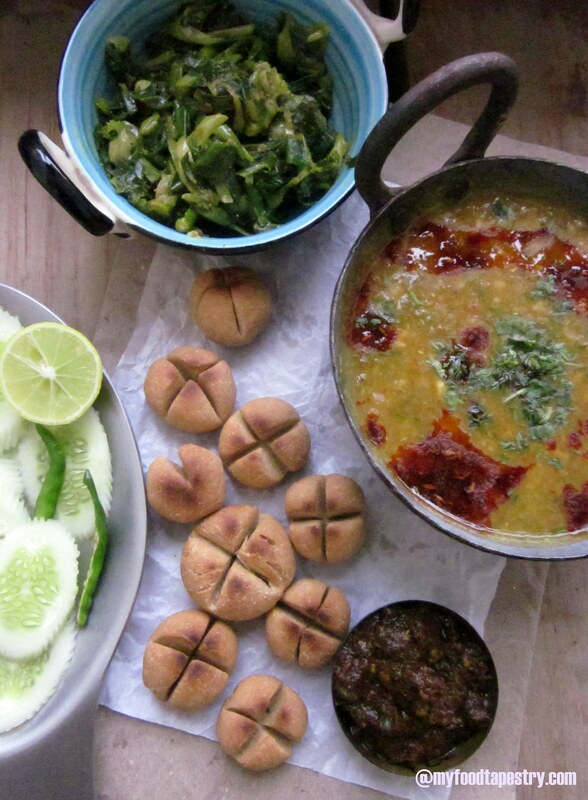 Now Rajasthan’s signature dish is Dal Baati. 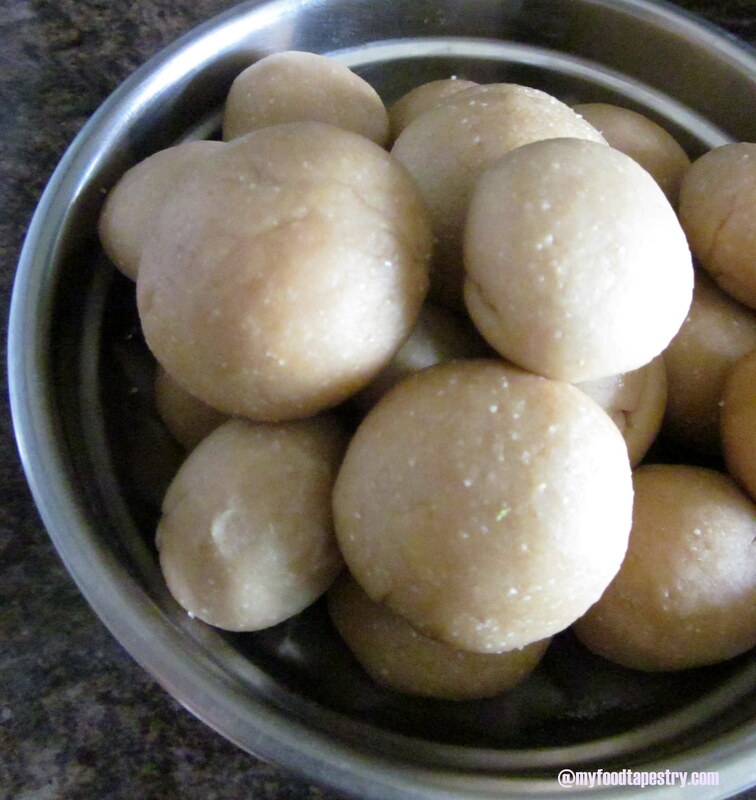 Baati is a hard, unleavened bread prized for its long shelf life and high nutritional content and for the minimal quantity of water required for its preparation. 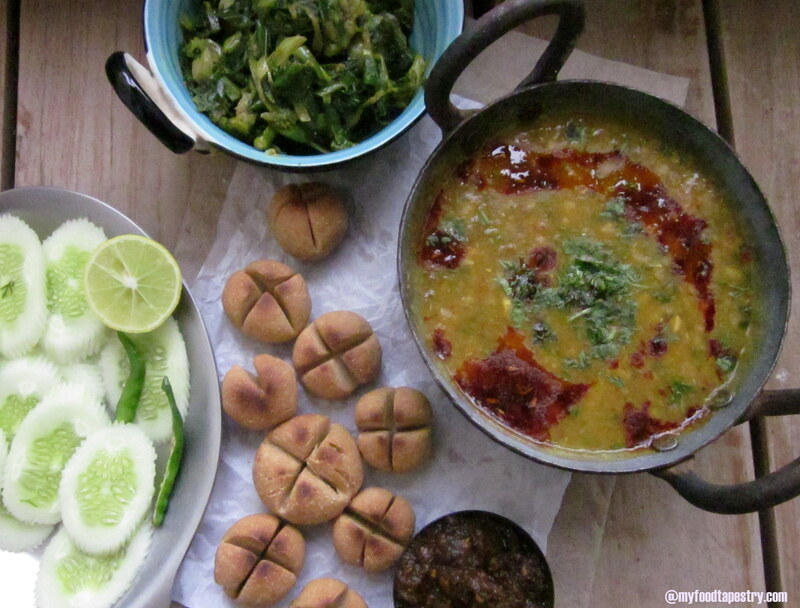 Baati is usually mostly eaten with dal/lentil stew. Traditionally, this dish is served with loads and loads of ghee/clarified buttter. But now since no one is happy eating that much ghee, we literally make it sans the fat. 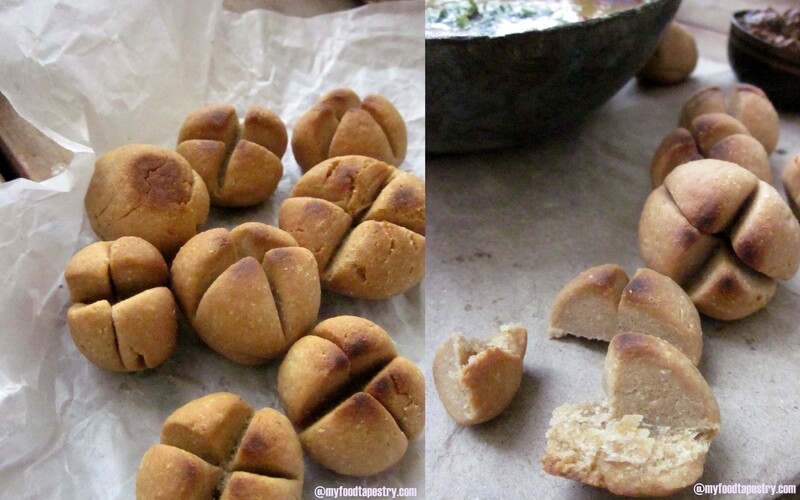 There are many ways to make the baati. The easiest is to deep fry the shaped dough in ghee till they turn golden brown and crisp. But that is also a sure shot way of clogging all your arteries and sending you to God a wee bit faster than desired. So, we have all taken to baking them. Lot of people bake with out a traditional oven, by slow roasting on the gas using a metal sieve or a gas tandoor till the baatis have browned. I use my regular oven and what I have learnt after many years of making horrendous mistakes is to make them small, literally bite size, so that they bake quickly and uniformly . Although shaping of the dough is actually a big pain in itself. To the flour, add semolina, salt and the softener(ghee or oil or cream). Rub well with your palms. Now add warm water and bind into a semi hard dough. This will take some time, as you want your dough to be a bit stiff. Knead well. Keep aside covered for 30 minutes. Now to make the rounds, pinch small portions out of the dough and shape into a ball, making sure that no creases or cracks are on the surface. To achieve this, you have to keep massaging the small round between your palms and shaping-reshaping them into perfect smooth round balls. Mind you this requires some time and patience, so my advice would be grab that bowl of dough, switch on the fan and put on some music, SIT and then start to make the rounds. Just makes it a little pleasant, that’s all. Preheat your oven. Once the rounds are made, using a sharp knife, make light incisions making sure they do not go all the way to the base. This is done to ensure they are baked evenly and the insides do not remain raw. Place the rounds on a greased tray and bake for at least 30 minutes at 170C, till they brown and are cooked evenly. You can keep turning and checking on them while they are baking. Once done, remove and keep them covered. Serving Suggestion: While serving, coarsely crush the baati between a clean kitchen napkin using your palms. Ideally the crushed bits are topped with spoonfuls of ghee and served with dal and other sides. This lentil stew is absolutely divine. Made with a mixture of 5 different lentils, tempered with garlic and onions, this makes for a perfect accompaniment for the royal baatis! 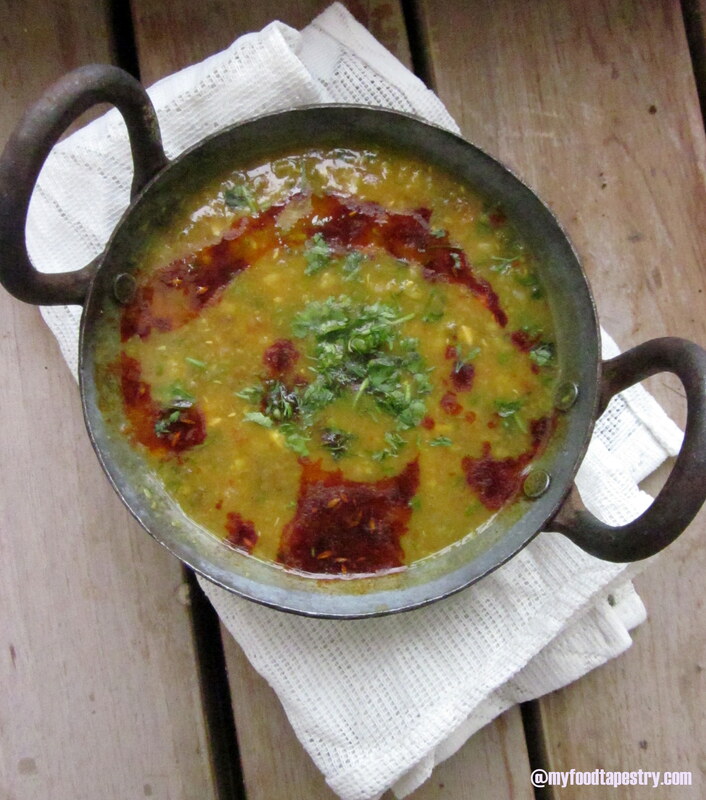 I usually eyeball the quantity of the daals/lentils and this dal is best made in ghee. Mix all the lentils, wash and soak for at least 30 minutes. In a pressure cooker or a pan, boil all the lentils along with turmeric powder, bay leaf, salt, julienned ginger and 2 crushed cloves of garlic. Garlic and bay leaf lend a tantalizing aroma to the lentil mix. Once done, keep aside. In a deep pot, heat ghee, crackle the cumin, fry minced garlic, slit green chilies and onions till they turn pink. Now add tomatoes, along with red chili powder. Cook till the fat leaves the sides and the tomato is fully mashed. This will take about 5-6 minutes. Now add the boiled dal. Mix well. Boil for a couple of more minutes till the consistency is one. Lastly, switch the flame off, stir in garam masala and chopped coriander leaves. Serving Suggestions: You can make an added tempering of ghee, one dried whole red chili, some cumin seeds and 1/2 tsp red chili powder. Pour it over the dal, serve hot. This has to be one of the easiest and tastiest saute ever. In a wok, heat little oil, crackle cumin, fry slit green chilies, throw in the chopped spring onions, along with salt, 1/4 tsp turmeric powder, red chili powder and 1/2 tsp coriander powder. Saute on high till the onions are rightly cooked, that is, not too mushy and still retaining a bite. That’s it. Serve. 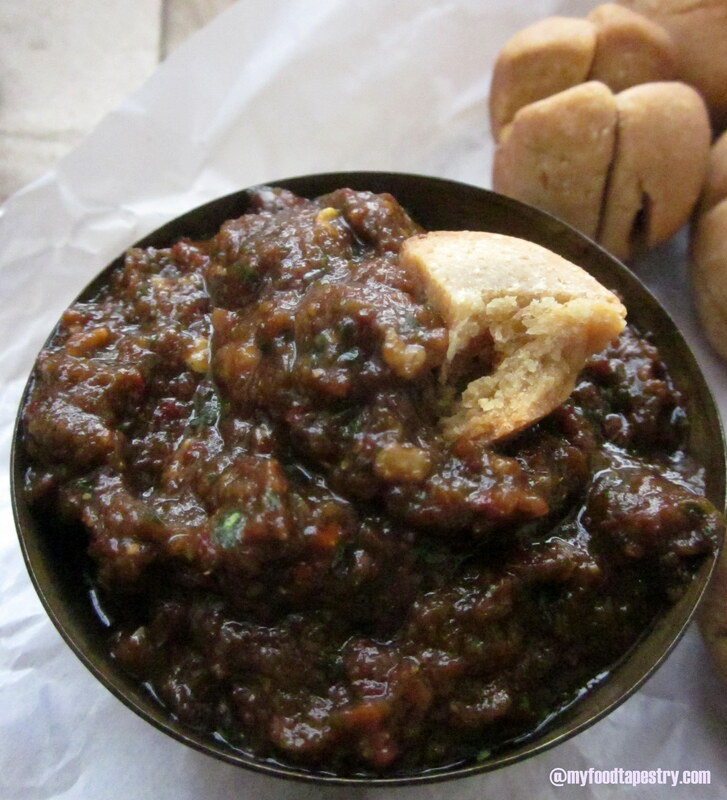 Now this is one killer chutney! 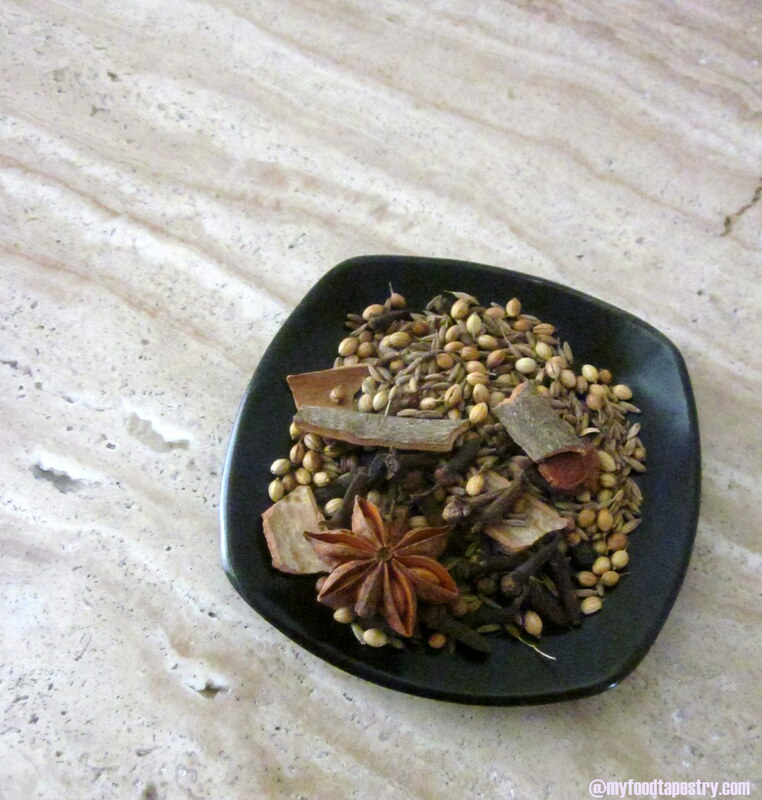 Best when made in a mortar pestle or over a stone. But a mixer would work fine as well. Take: 1/2 cup chopped coriander leaves , 1/4 cup mint leaves, 6/7 soaked dried kashmiri red chilies, 1 huge clove of garlic and some salt. Grind into a coarse paste. Mix in juice of 1/2 a lime. Serve. 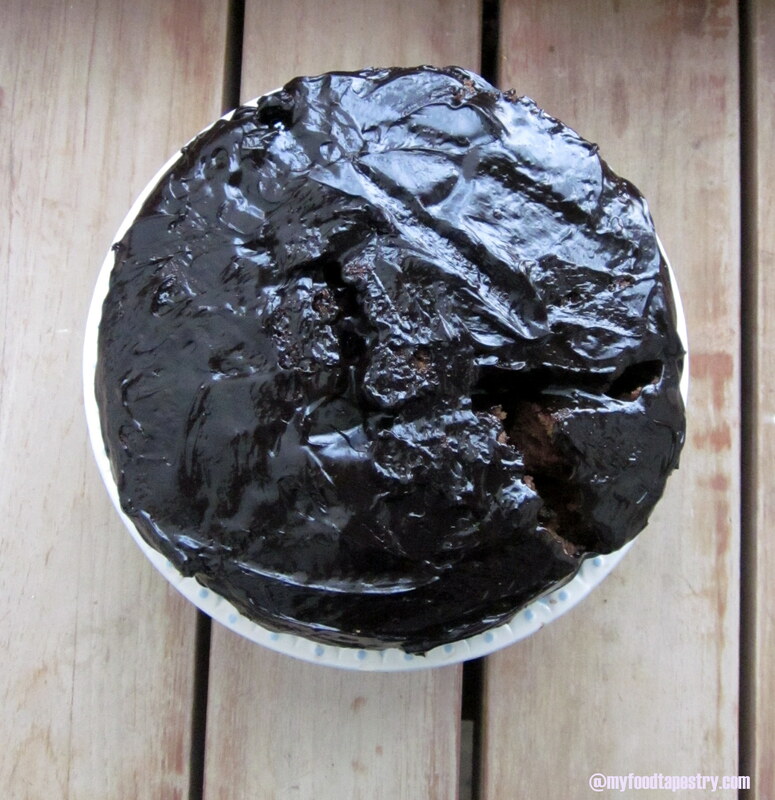 This recipe is my entry to Vardhini’s Bake Fest #25. I don’t know what’s wrong with me. I’ve been told to make my posts shorter and put one recipes at a time. But I still end up combining 2-3 dishes and presenting it to you. Ah! Pains of a stubborn unlearning mind. I do have a reason for my repetitive obdurate intentional attempts of long posts – One recipe and its versatility. Like, the guacamole post showed that apart from the dip you could make a sandwich too or the garlic roasted potatoes make for a very good and filling wrap. Hence my loooong posts. Fair enough? I know, NO. 😉 Well, I hope this post is one of the last few of the combined recipes posts! 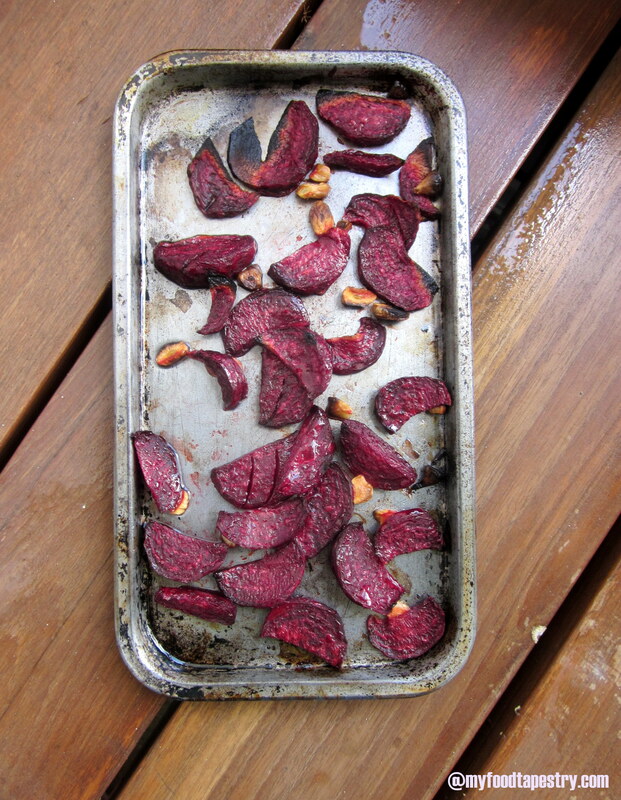 Roasted Beets along with garlic, just rubbed with a little salt and olive oil makes a very very yummy eat! I popped one in my mouth, and the flavor was fresh, juicy and succulent. I think, this, on its own is one great way to eat the root. 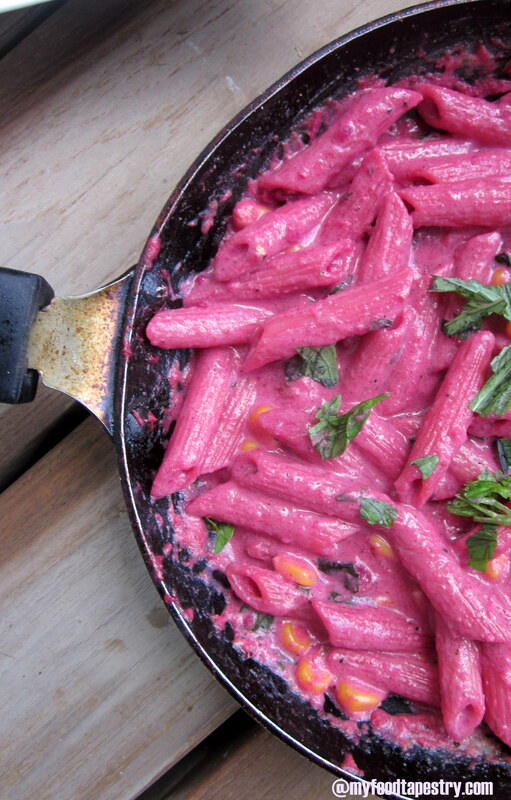 But – I saved the roasted way for another day, as now I craved for some gorgeous pasta. 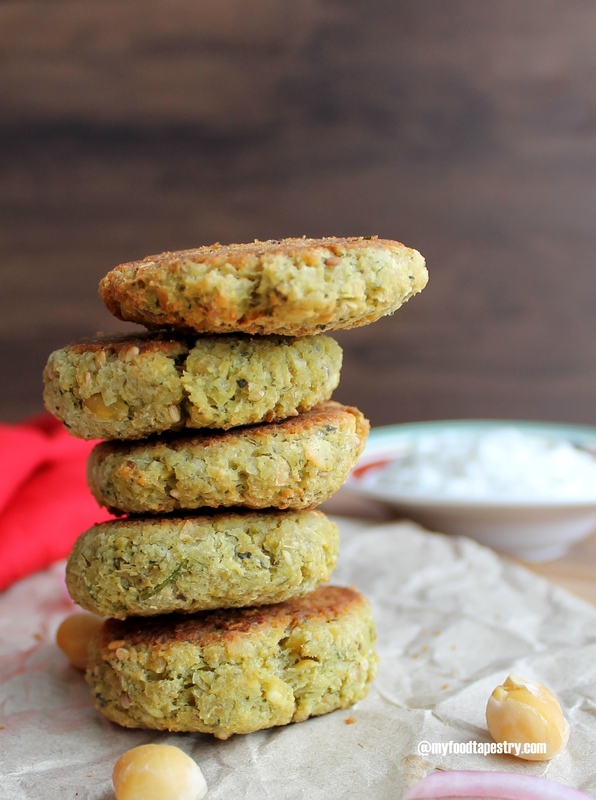 This bookmarked recipe of mine was waiting to be tried and tested. With my little daughter in school, husband traveling and my sudden pasta yearnings, the day seemed perfect to experiment. I slightly tweaked the recipe according to the ingredients available at hand and of course my mood. Rub a little olive oil and salt on the sliced beets along with the garlic. Spread on a baking tray and bake at 175 C for 15 minutes or so, till all the juices are released and beets are soft. Alternatively, you could saute them in a frying pan with little olive oil. Once cool, put the roasted veggies in a mixer, add parmesan, walnuts, lime juice and salt. Grind to a semi smooth paste. Use water if required. Add olive oil. Mix well. Use as required. The color stuns you, the nutty taste lingers for long and the health quotient gives you enough reason to digg in for more. 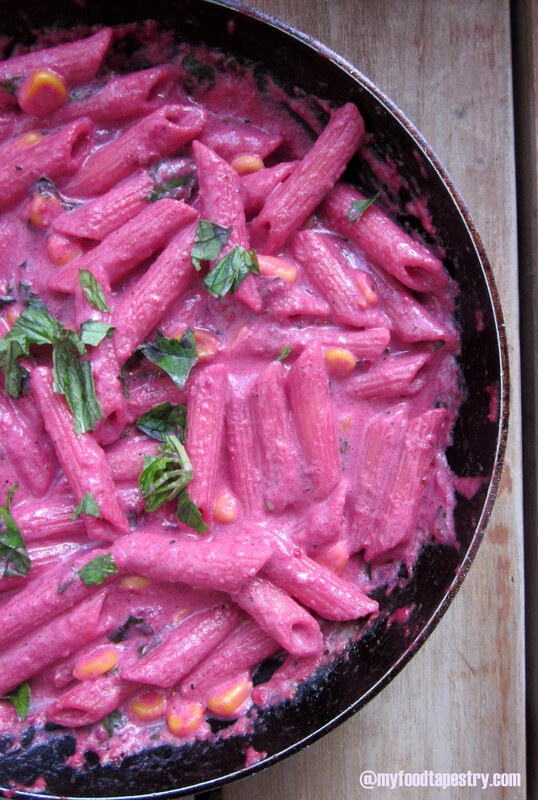 So with the pink pesto, some corn and fresh basil, I made magic with my Penne. In a pan, heat oil or butter, saute corn. Once done, add flour to it. Let it coat the kernels. Mix in milk and keep stirring till the milk thickens. Now add salt, pepper, oregano, red chili flakes and pesto. Mix well. 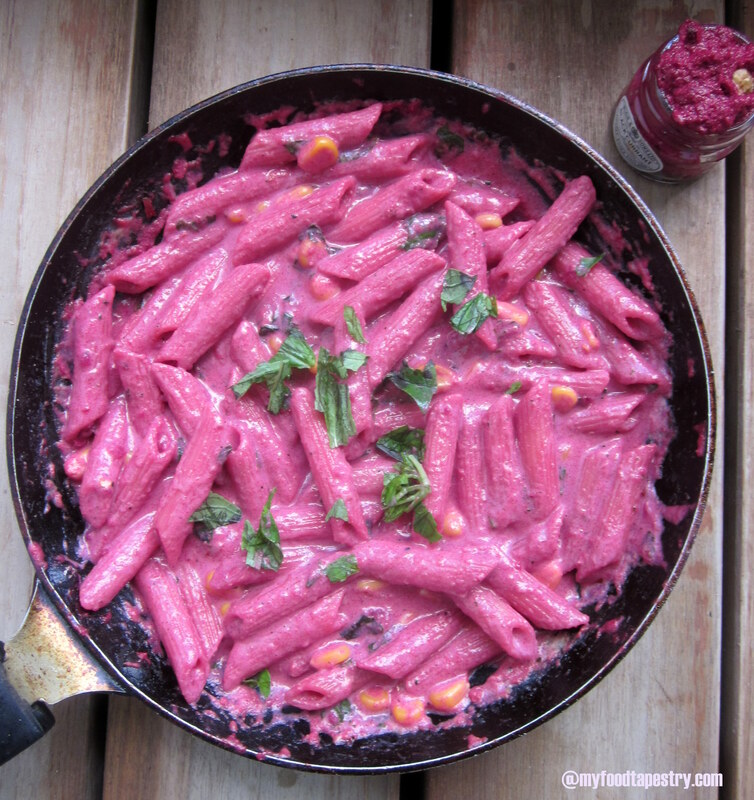 Stir in the penne. Then garnish with chopped basil leaves. Enjoy it hot! Note: Feel Free to add any veggies of your choice – broccoli, carrots, mushrooms, onions and pepper… list is endless. I sautéed some thinly sliced veggies like onions, peppers, carrots and mushrooms, along with salt and pepper powder. 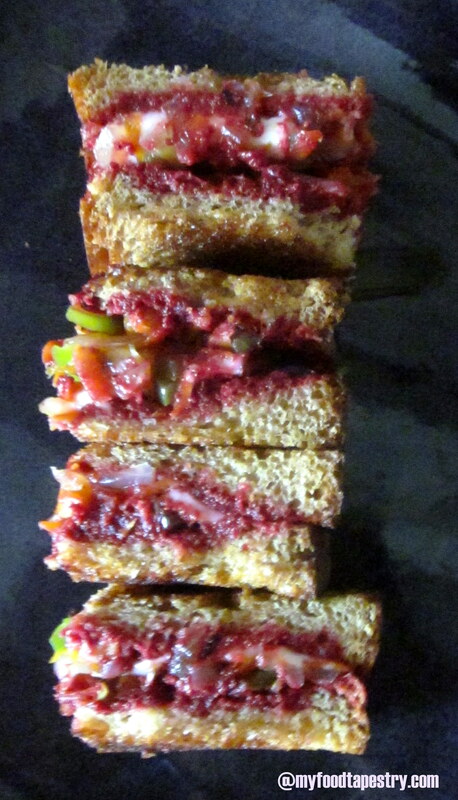 Generously applied beet pesto to 2 slices of bread, placed the sautéed veggies and a slice of cheese on one pesto smeared bread. Covered it with the other bread. Grill with little olive oil or butter. Done! Best Enjoyed with ketch up and hot sauce. 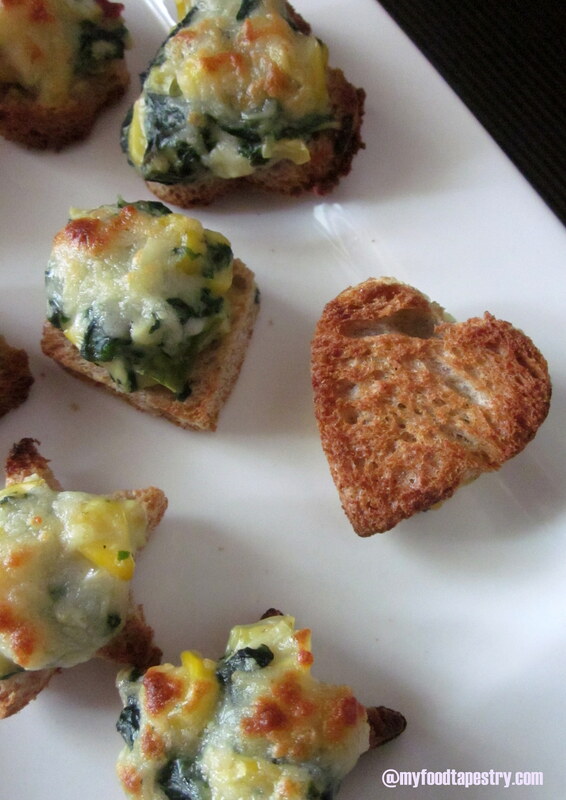 5. on crostinis and on canapes. If you can think of any other way, do drop a line. So, I cooked a good deal one morning. Made this creamy spread, fixed sandwiches and canapes, roasted healthy parathas, potato saute, baked a simple eggless chocolate cake with a divine ganache(the cake was too soft so it fell apart, but that didn’t deter us from grabbing mouthfuls!). I am not making a post of the cake. Fabulous to taste but a dud to look at, so would you call that a recipe failure or what? My girl absolutely abhors peas and corn in her food. Corn on the cob is ok, but none of the sweet corn kernels in her parathas or rice or pasta. I had to make her like it. Somehow. Simply because it was turning to be a pain, to cook separately for Miss finicky or sometimes remove the bits that sneaked in. Pain. 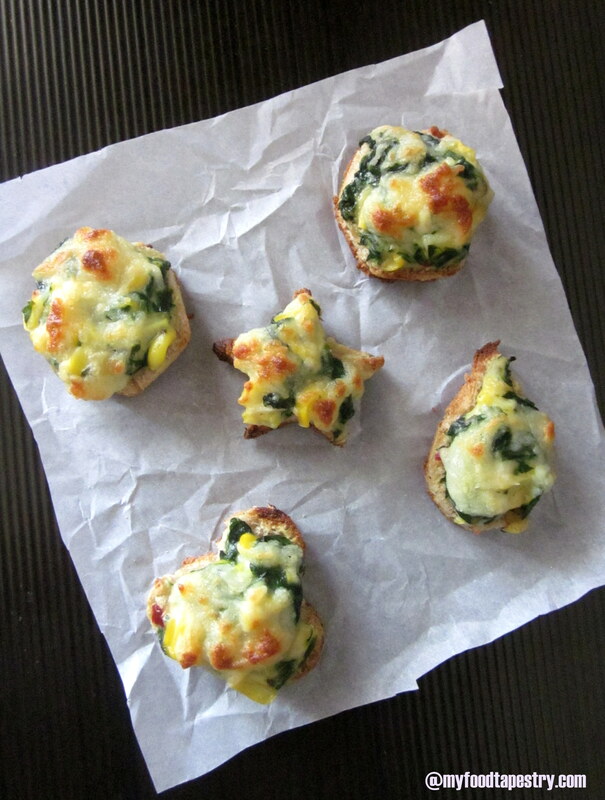 So here my new little helpers, cookie cutters helped me draw Milee’s attention to corn and wonder veggie spinach. Using the cutters, scooped different shapes of bread, dabbed little bit of the spread, sprinkled cheese and baked to golden perfection! No bribing, No threatening, No screaming. It all worked like a charm. Gone in minutes, she comes back for more. Yay! The dip also turned into a wonderful spread when combined with green mint chutney(my favorite! I put it on everything) and some ketchup on the side. A steaming cup of hot masala tea/chai is all that I needed to complete my breakfast. Tea with milk and sugar, enhanced by crushed pounded ginger, guest appearance of cardamom and cinnamon is our very own Indian masala chai. 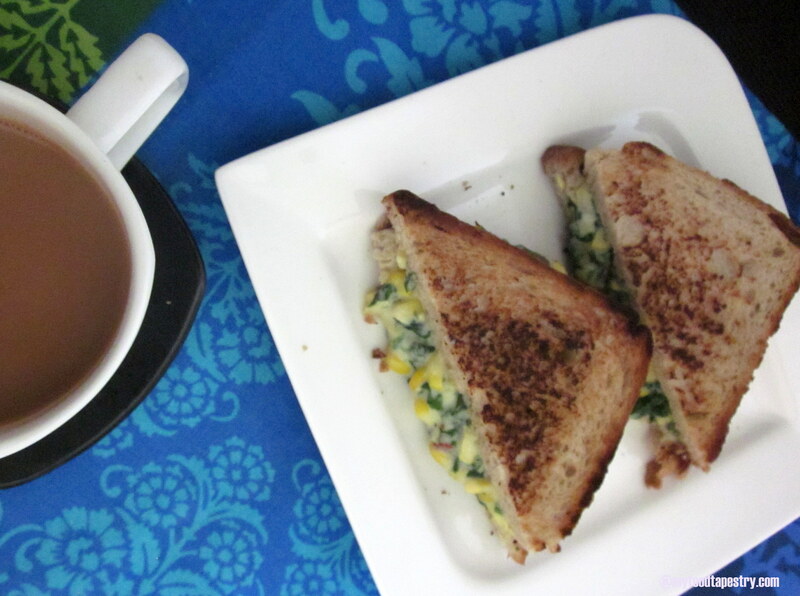 Although I try not to start my day with a cup of tea, but with breakfast it’s mandatory. 1 cup corn kernels, coarsely cut. Just place them on the board and using a knife, roughly chop them. 1 tbsp butter or olive oil. In a wok, heat butter/oil. Saute garlic and onions. Add corn kernels along with the salt. After 2-3 minutes, throw in the flour. Let it coat all the veggies. Now add milk, keep stirring, till the milk thickens. 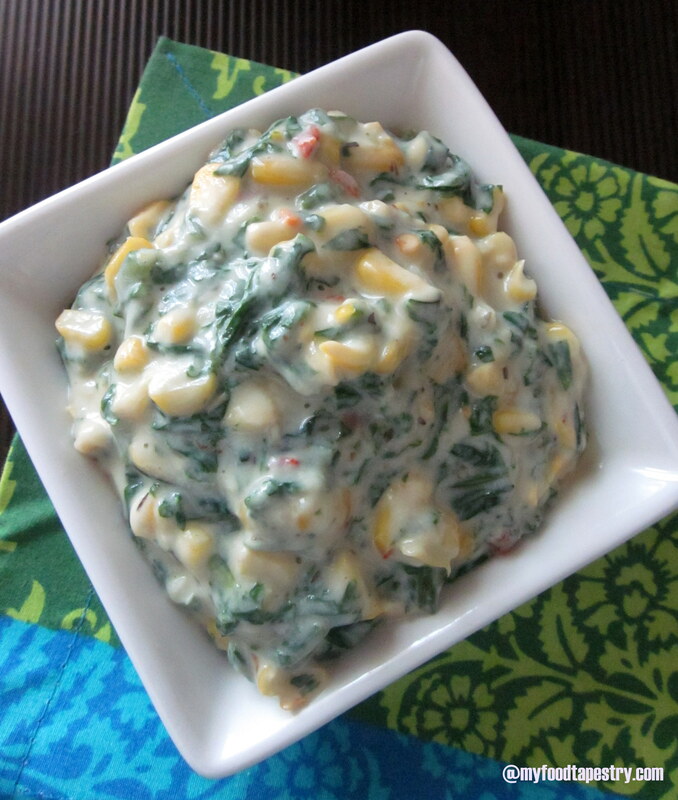 Mix in the spinach. Season with oregano and red chili flakes. If using cheese or cream. Mix in now. The sauce should be creamy and thick. Garnish with chopped coriander leaves. Note: If you wish to use the sauce as a dip for your croutons or cucumbers, then add more milk to get the consistency a little runny. If using as a spread on bread or parathas, then you might want it to be a little thick, so in that case, reduce the quantity of milk. Note: Garlic and onions can be avoided. I just used them as flavor enhancers. Note: Spinach is best blanched in wilting the leaves in hot water for 3-4 minutes, then immediately running them in cold water. This retains the fabulous color. 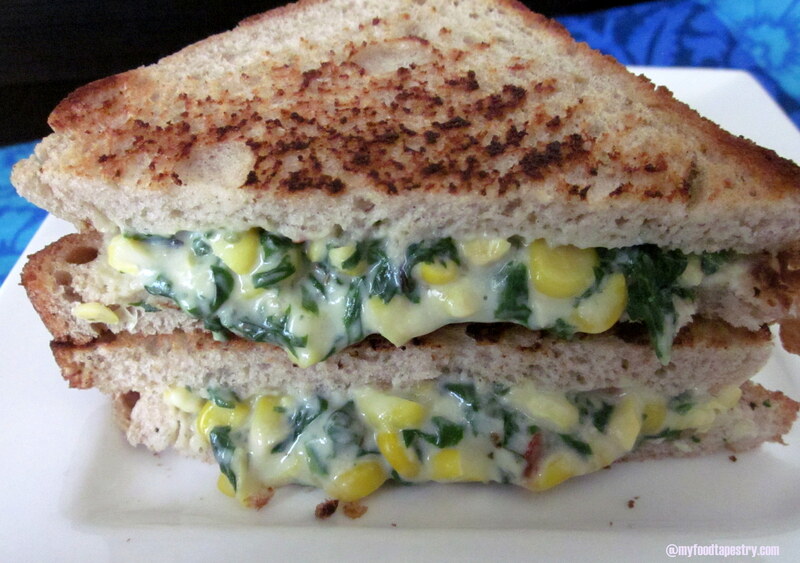 Note: To not wash away the essential nutrients of spinach. 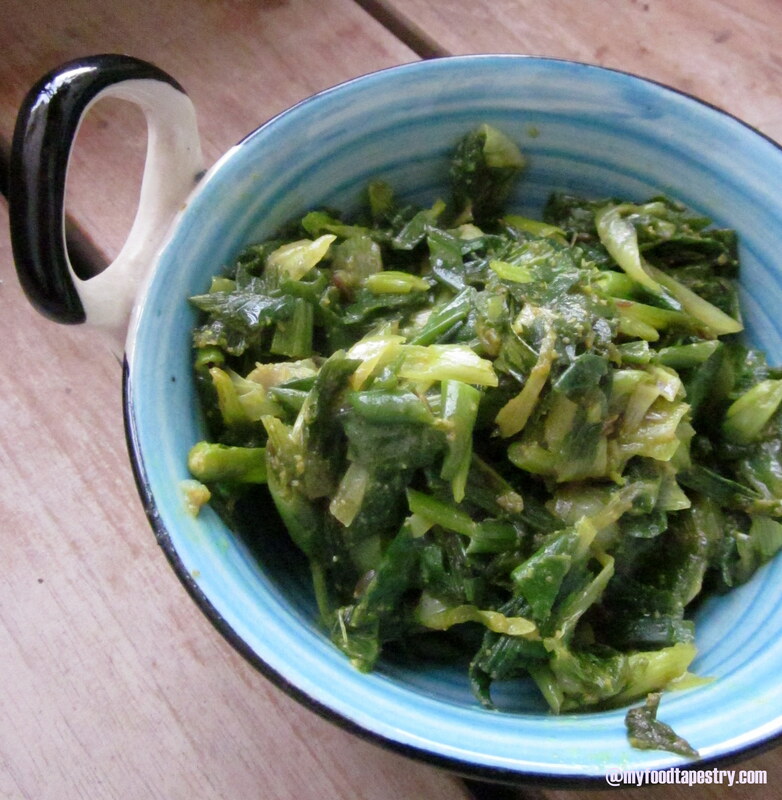 I suggest: wash the leaves well, chop them roughly, then blanch the leaves in very little hot water. Do not throw away the water, use them in boiling lentils/pulses or in your daily dough. I applied a layer of green chutney on both slices of bread, spread the sauce, cover with the other slice and roast or grill or toast. 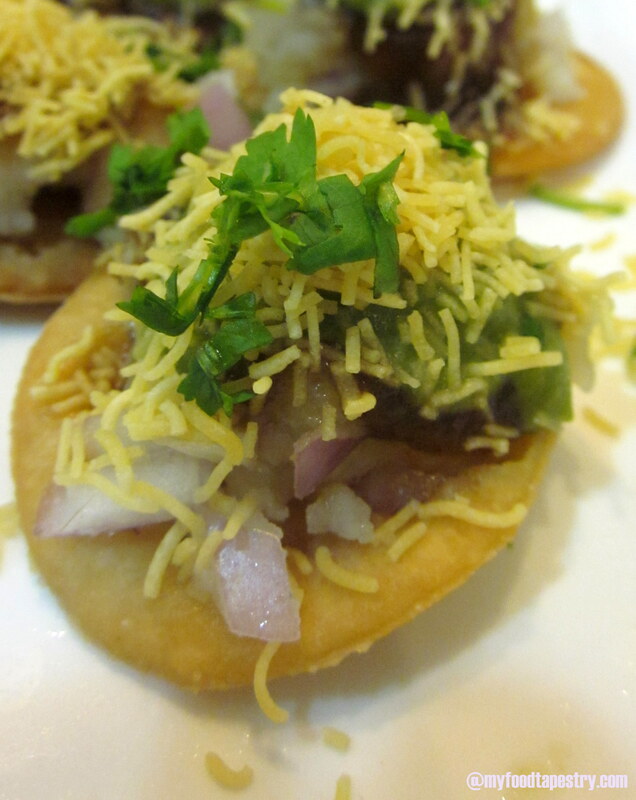 A Sev Puri – Inviting? Now pick this beautifully decorated cracker, put the whole thing in your mouth… no bite shite… the whole cracker…sit back.. explosive mouthful of sweet, spice, tang, soft potato, crisp cracker…sigh! heaven! What you just ate was a SEV PURI. I haven’t met one Indian who hasn’t grown up eating Chaat, typically served at road side stalls. The health freak in my house keeps me on my toes with his eating habits.. but the same guy makes an exception for the love of his life(not me) — CHAAT. He has kept one day in a week when he indulges in food, and every time its chaat what he wants. 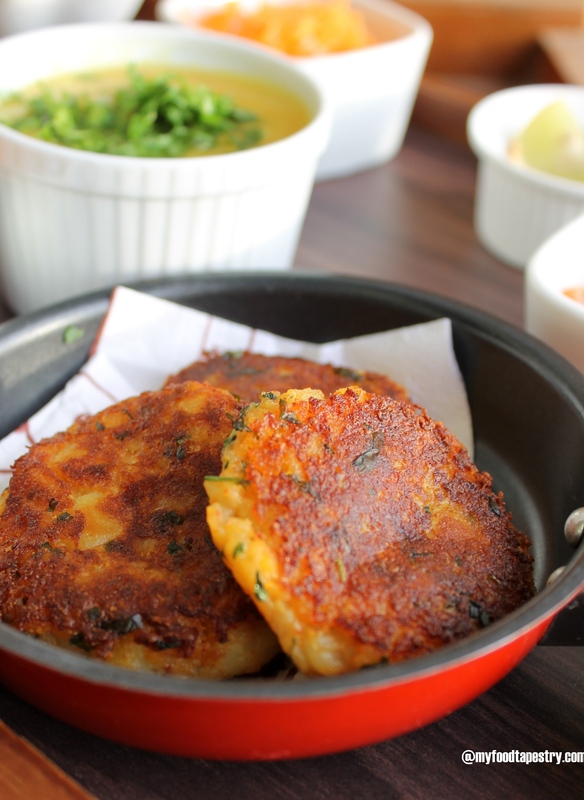 Have I magnified the glory of this stupendous Indian street food enough? 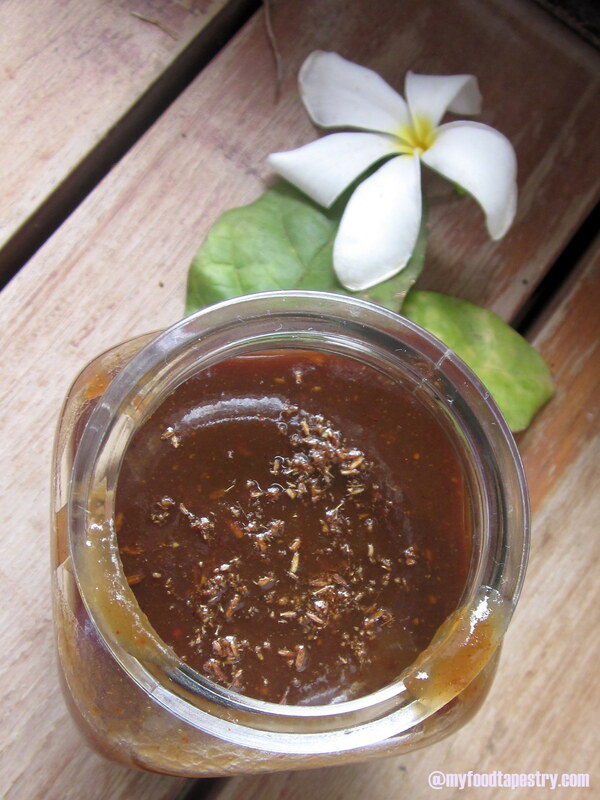 Well.. a very important integral component of this type of food is a sweet tangy mildly spiced Tamarind Jaggery chutney. 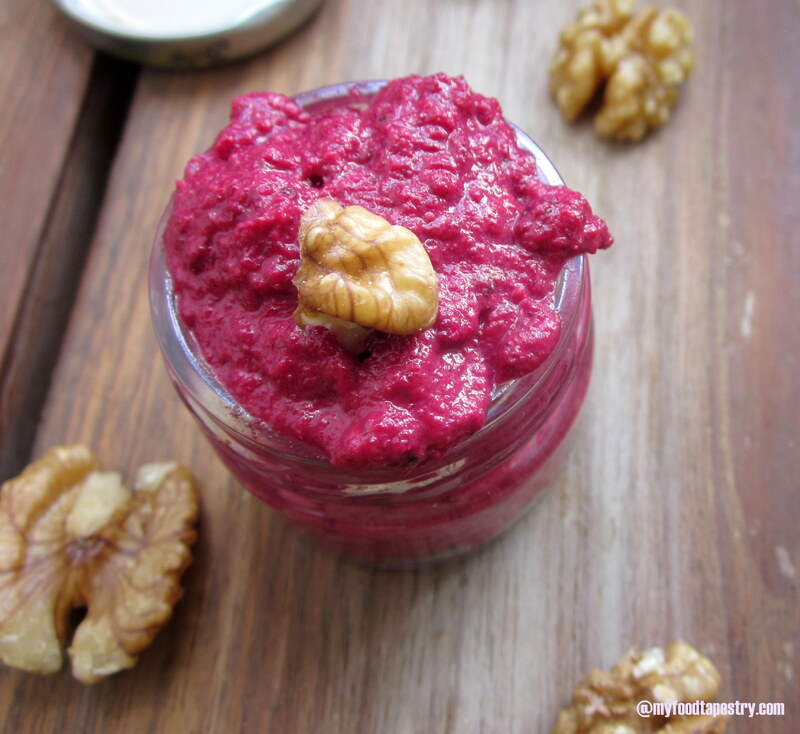 Addition of dates adds to the taste and health value of this highly muti purpose dip. The flavors are so extreme and intense that just a wee bit is enough for every bite. Just a spoonfull is enough! Since the rains are creating quite a havoc, we generally refrain from eating out, especially street side fare. So, with all of us dying for mouthwatering(literally) plates of sev puri, bhel puri and pani puri, I set out to satiate those cruel cravings. 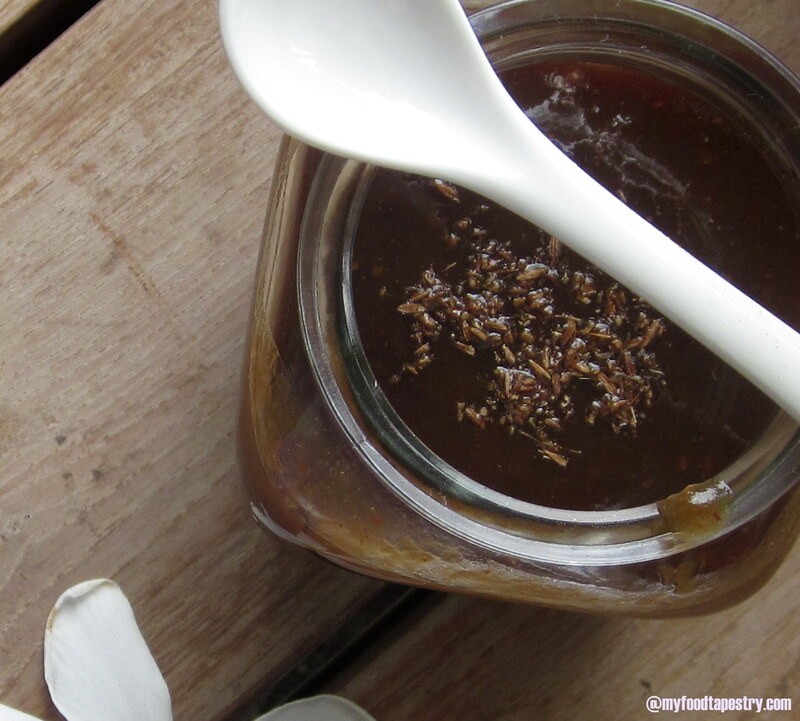 Starts with me preparing this tangy tamarind dip. 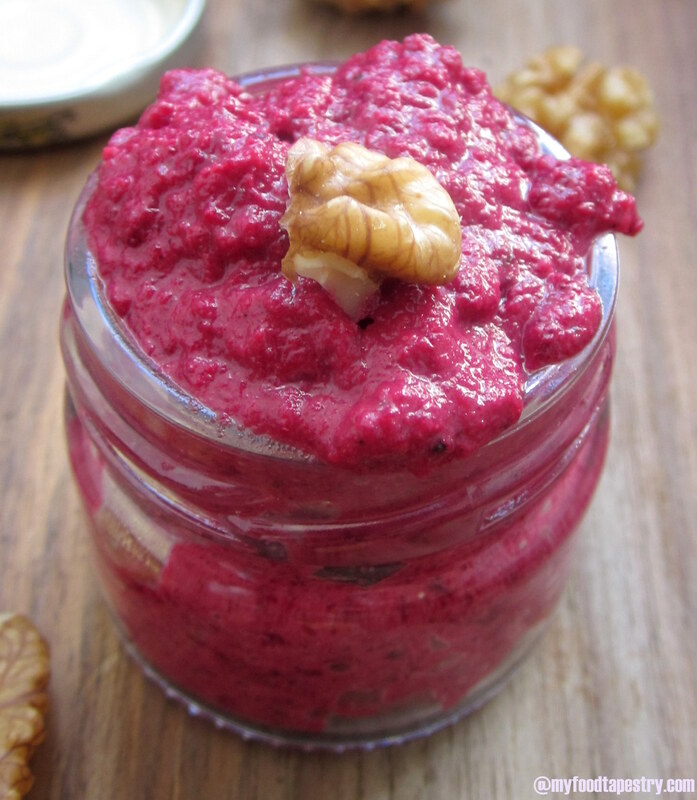 Its a wonderful puree, which once made, can stay refrigerated for over 3 months! 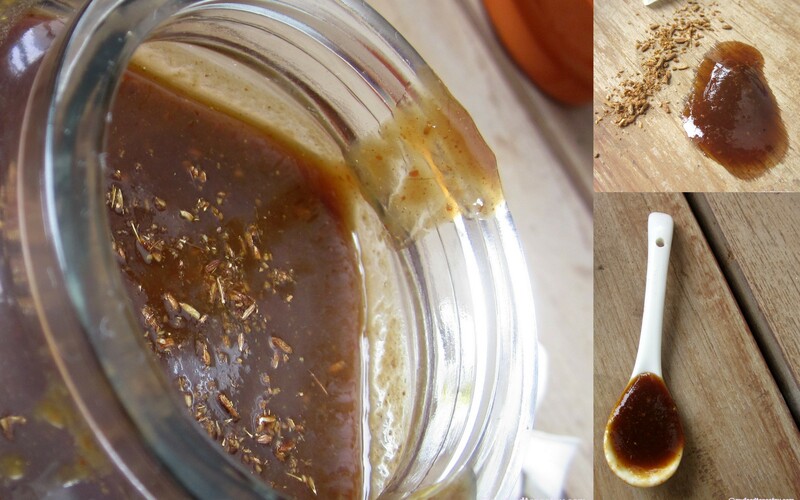 1 cup jaggery, if its hard, you might want to soften and broken into small pieces. Soak the dates, tamarind in warm water for atleast 30 minutes. 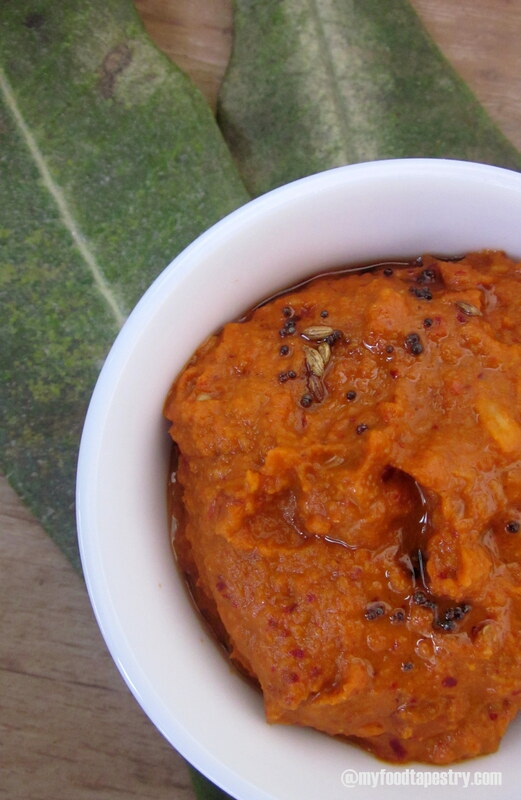 Then remove excess water, grind dates, tamarind and jaggery to a smooth puree. 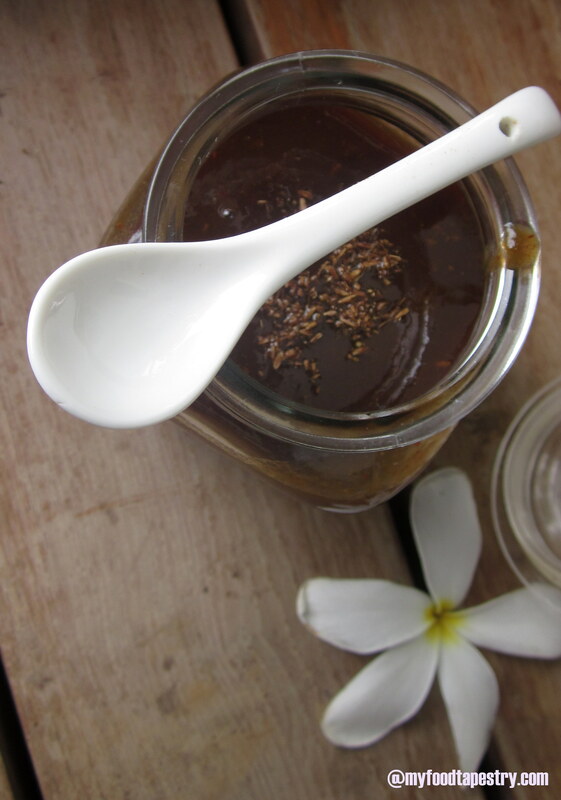 Using a proper sieve, remove the hard bits and any fine tamarind hair or skin. Did I confuse you? I just mean: Sieve it to get a clear smooth semi thick puree. Now, transfer the contents into a pan, add salt, chili powder and boil for at least 10 minutes. It tastes perfectly fine without boiling too, but if you need to store it, boiling is best. Let it cool completely. Transfer into air tight containers and use as required. 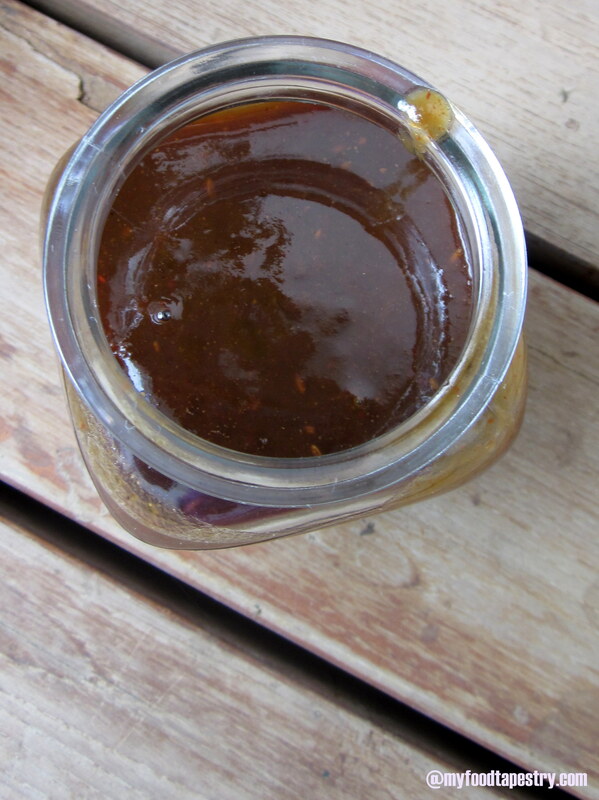 Note: Dates give this chutney an awesome body and consistency. They enhance the taste and needless to add boost your iron content. 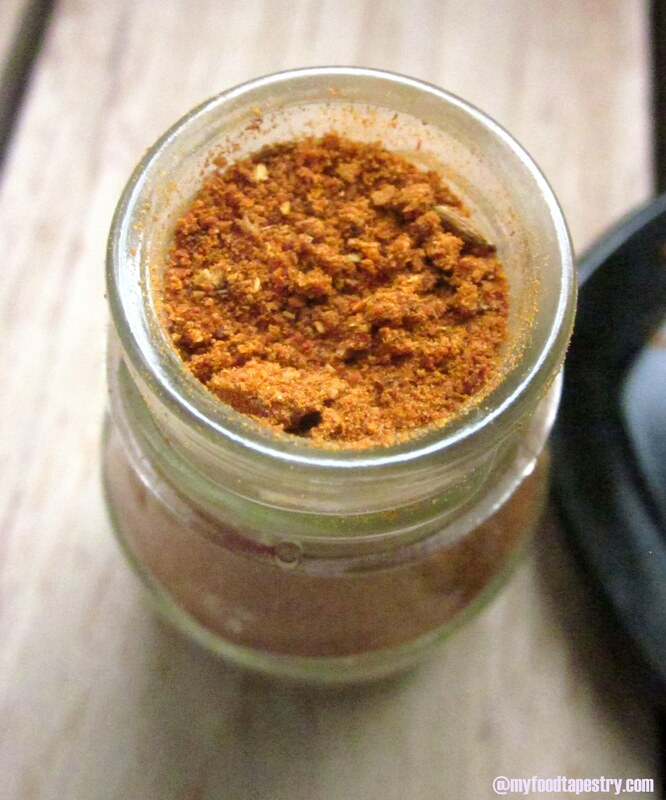 Note: If you do not want to use tamarind, you can substitute with dry mango powder. 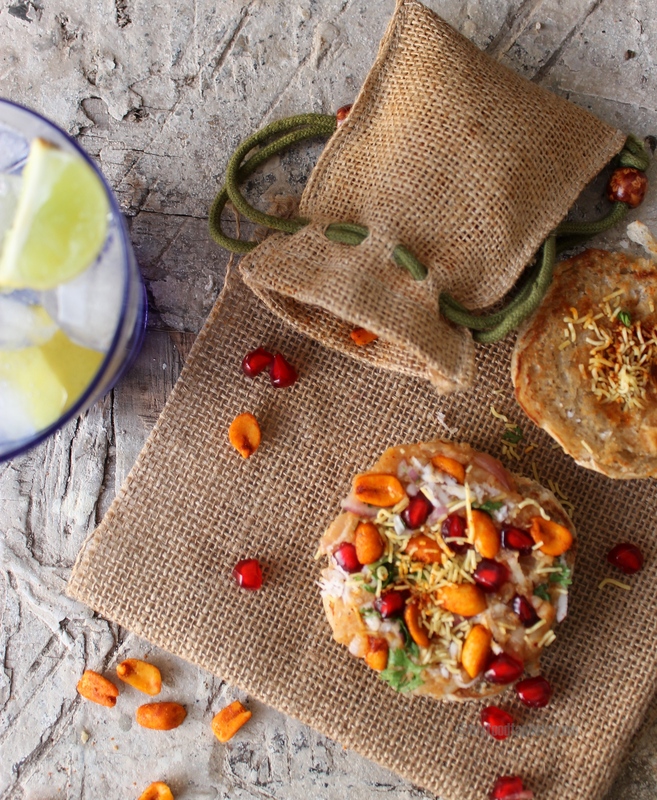 So, dear friends, if you’re new to chaat, start with this chutney, try it as a dip with fritters/corn chips, dab it on your sev puri, stir it in your mint water, mix it in dal-lentil soup… and just see how it transforms your little bite into a mouthful.